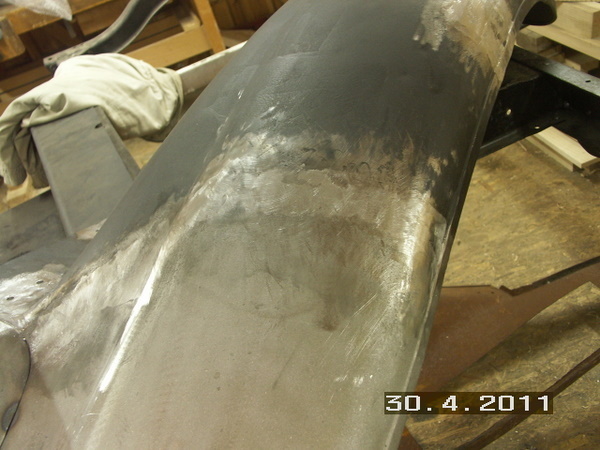 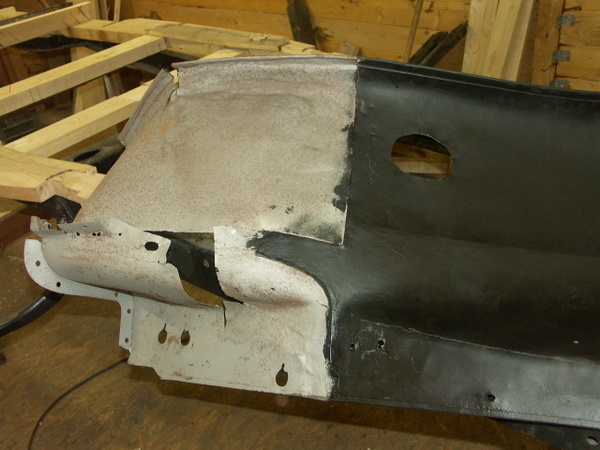 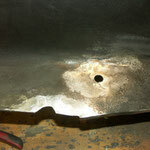 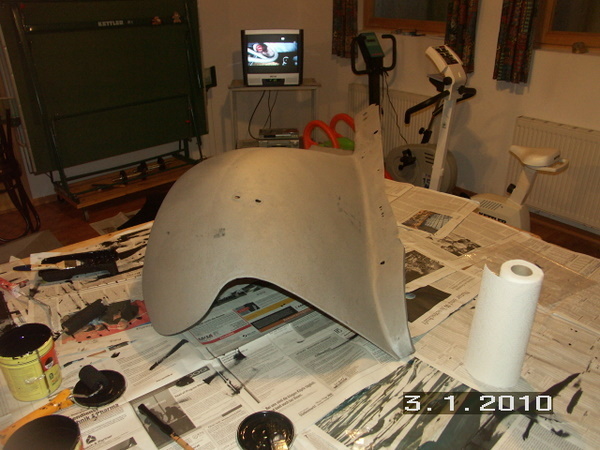 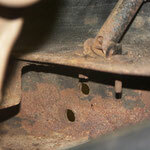 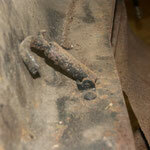 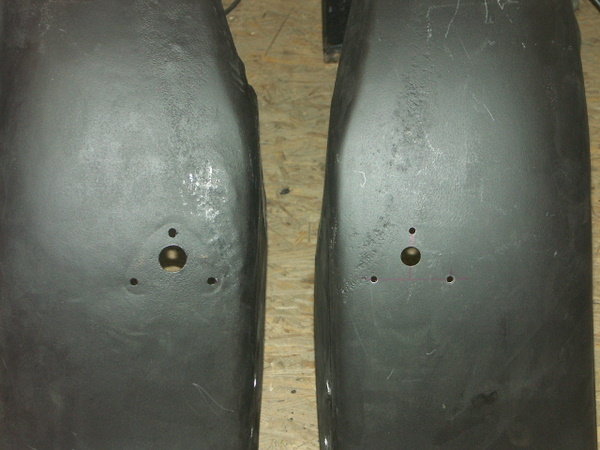 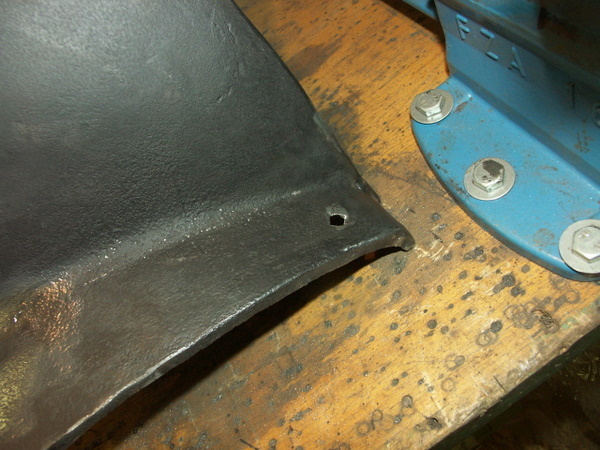 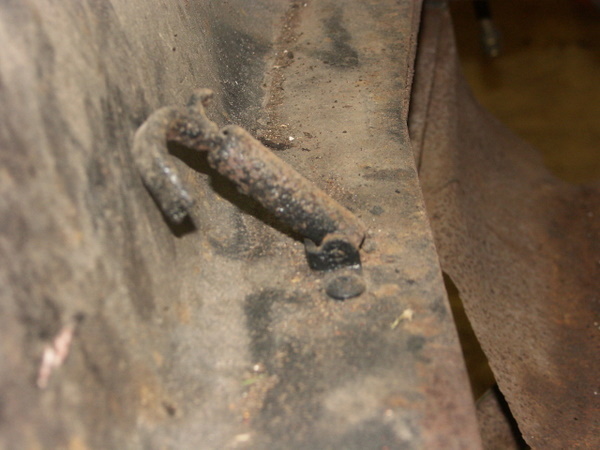 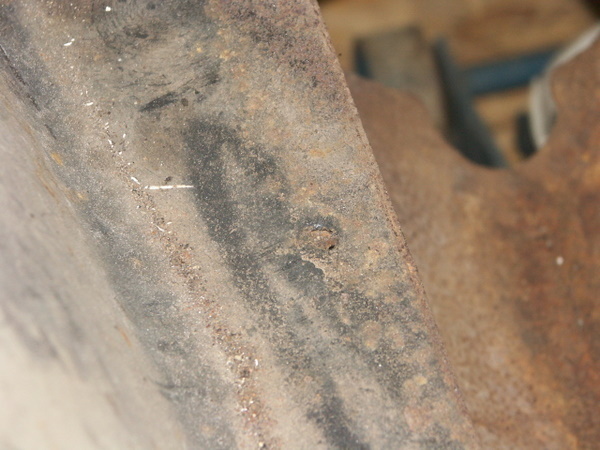 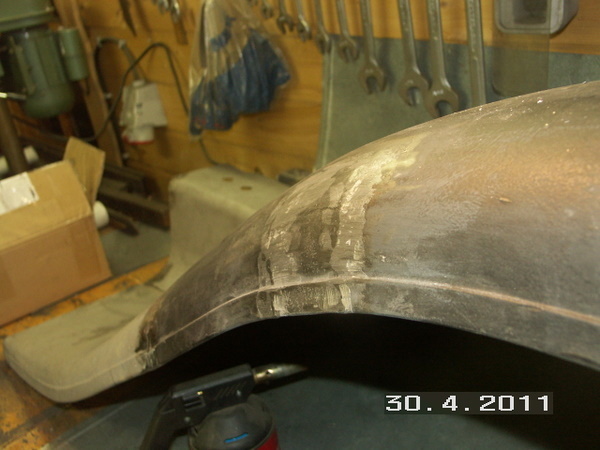 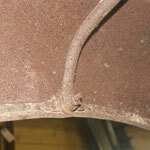 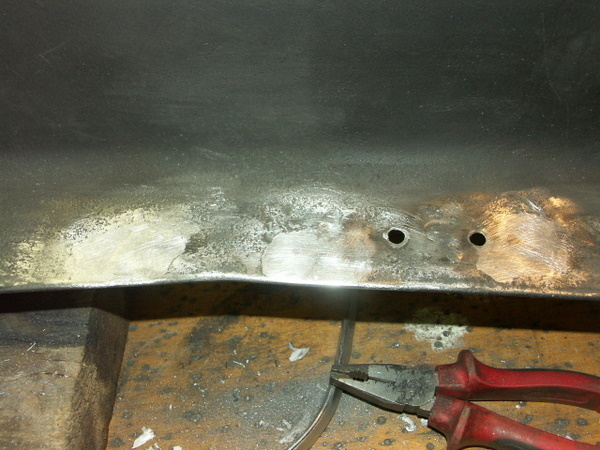 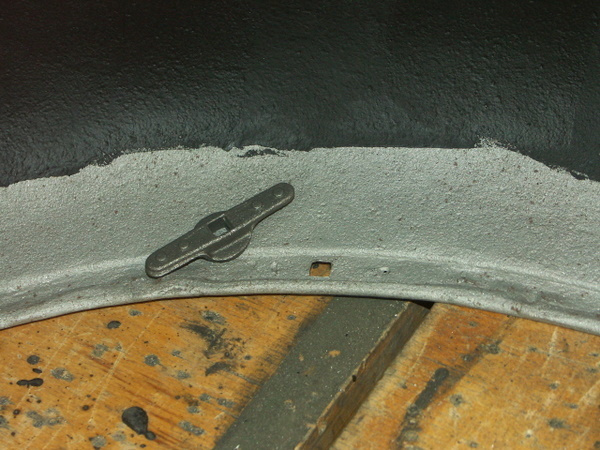 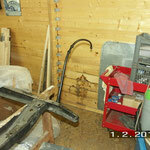 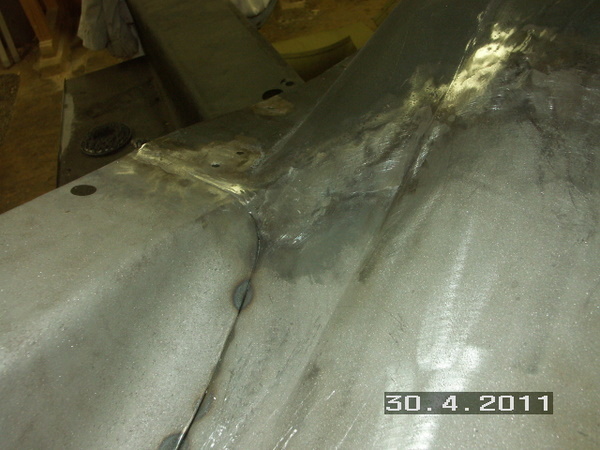 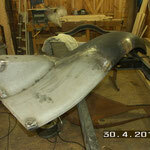 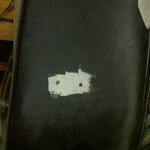 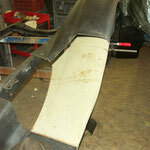 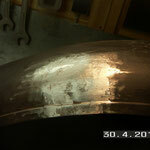 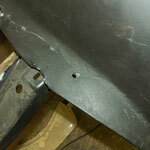 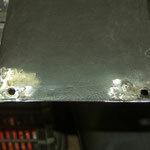 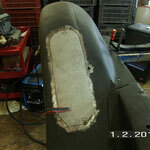 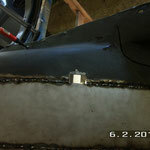 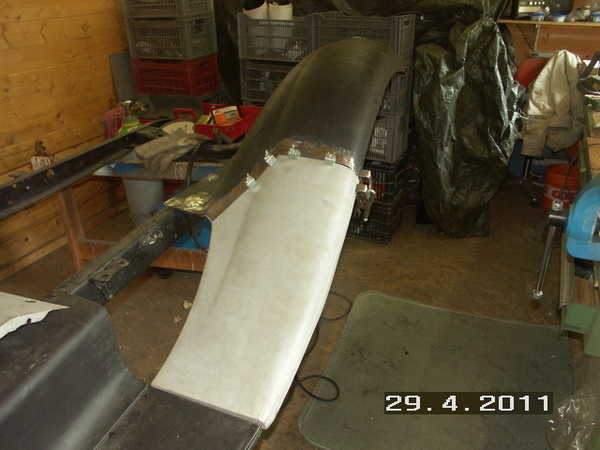 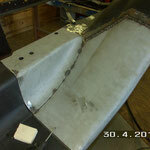 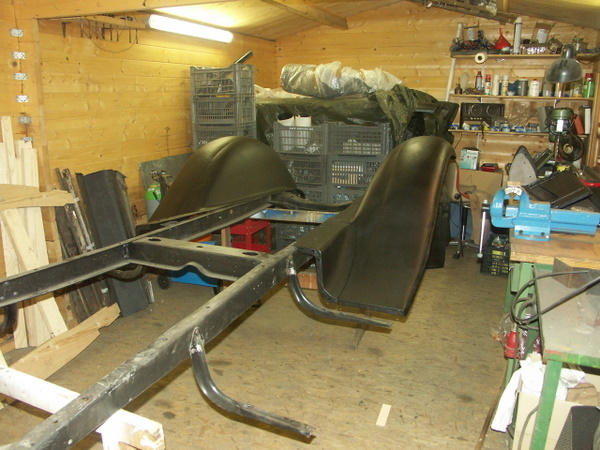 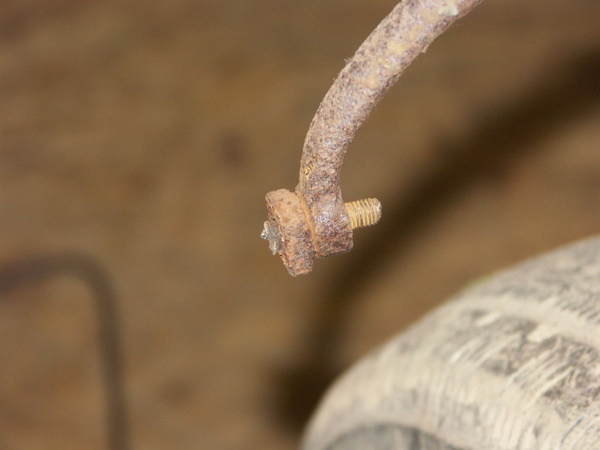 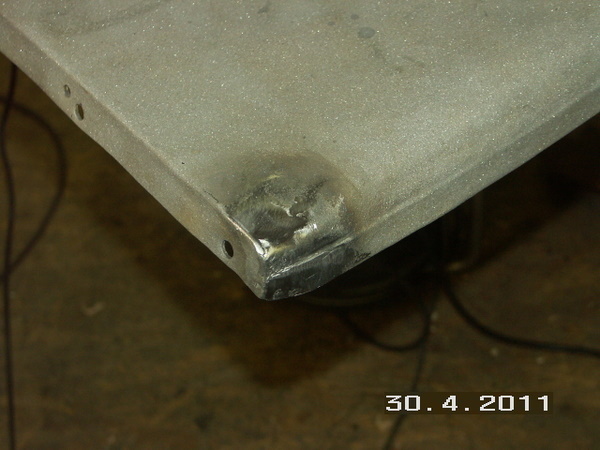 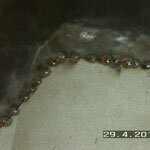 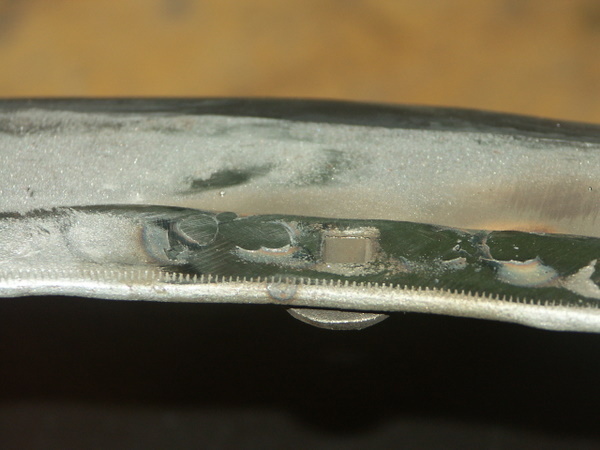 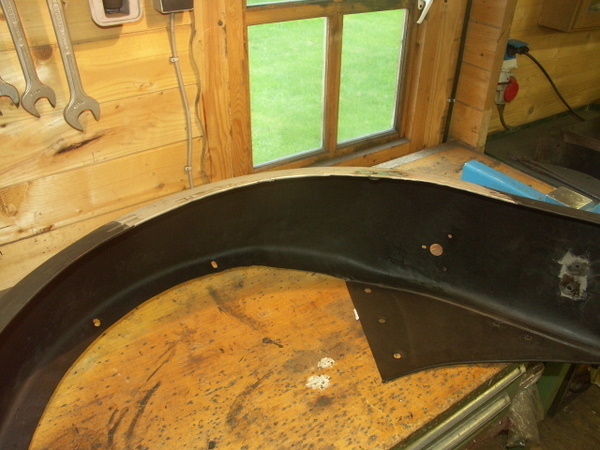 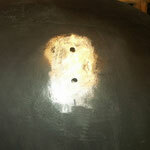 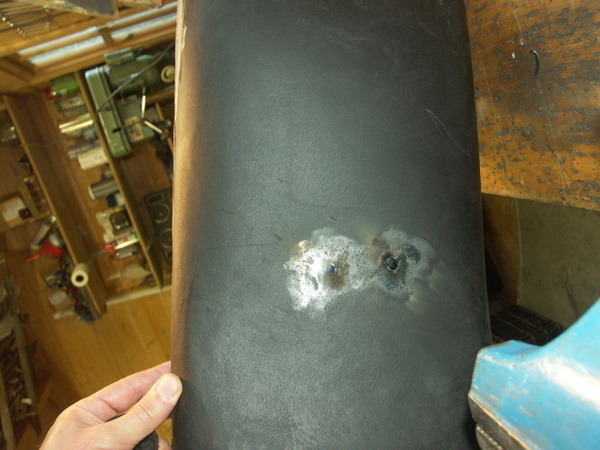 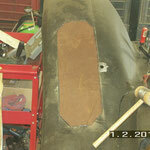 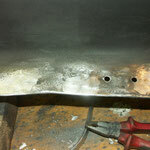 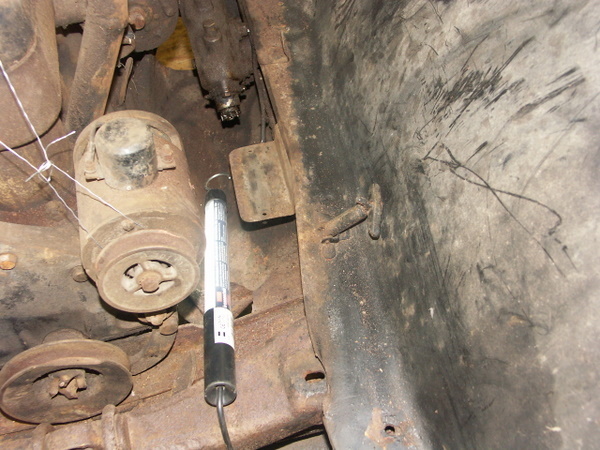 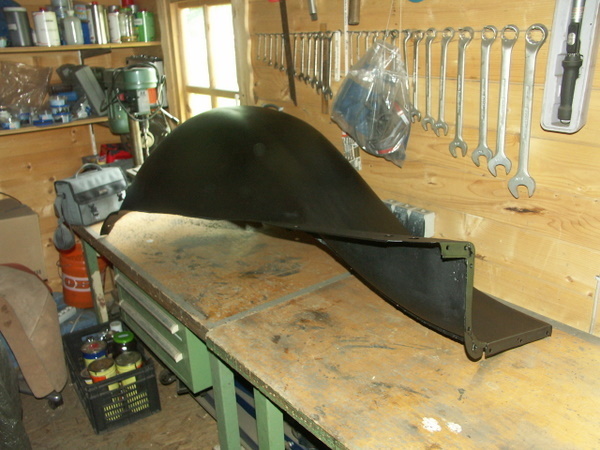 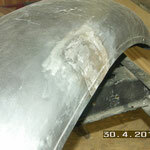 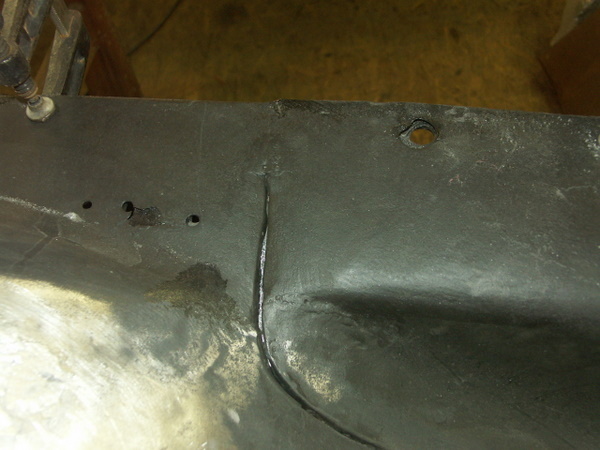 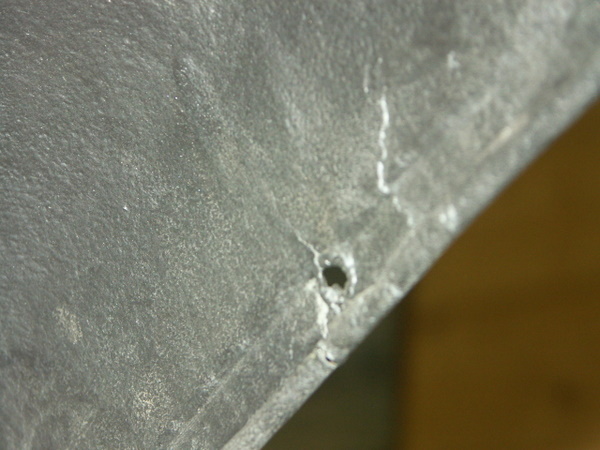 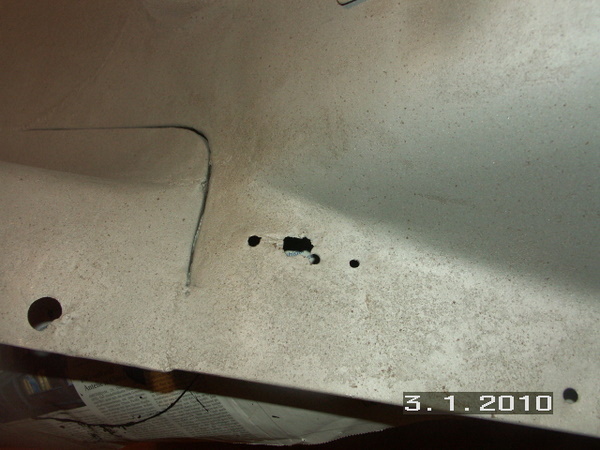 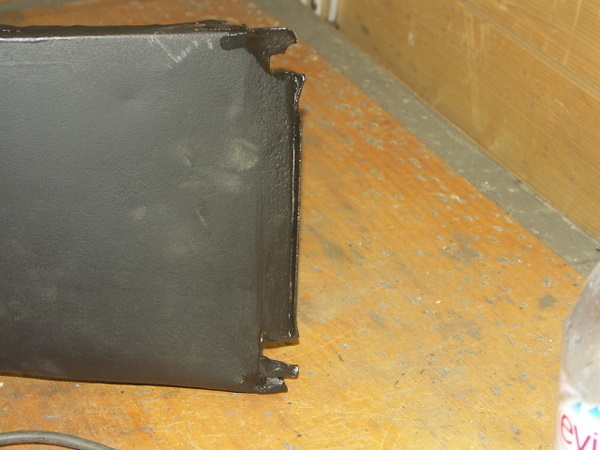 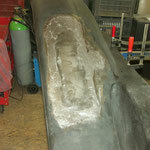 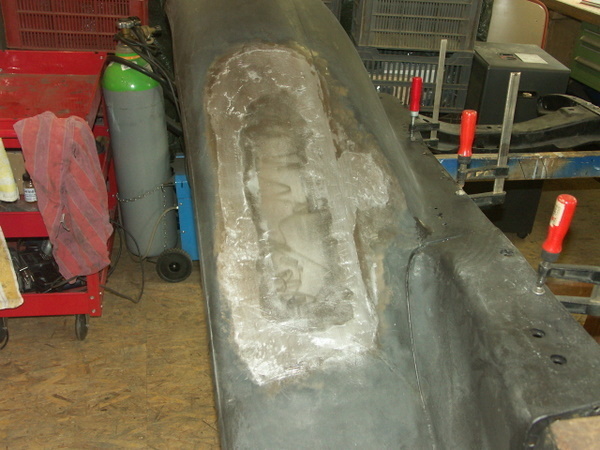 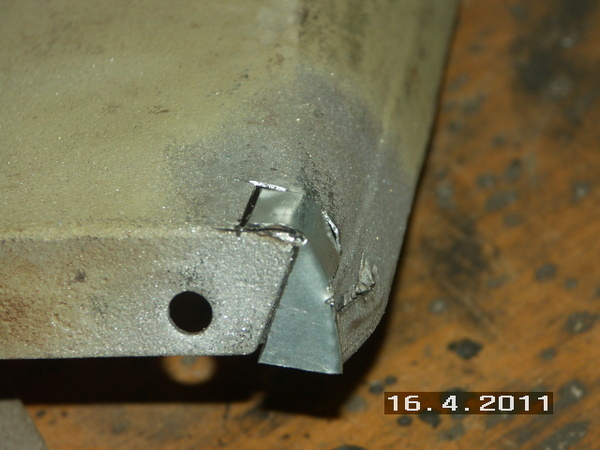 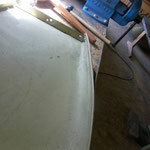 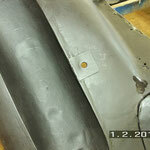 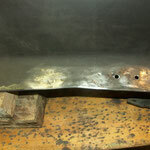 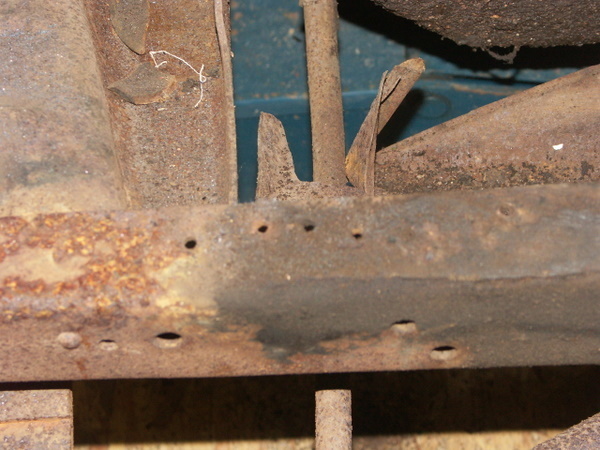 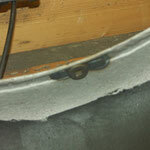 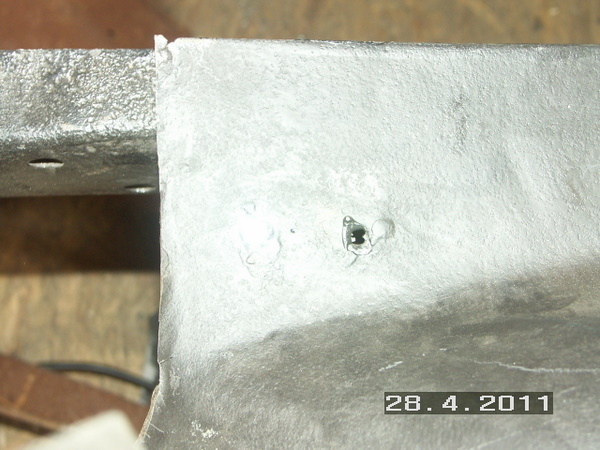 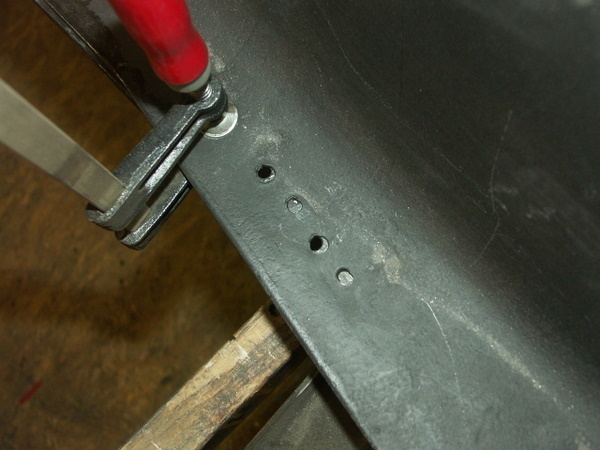 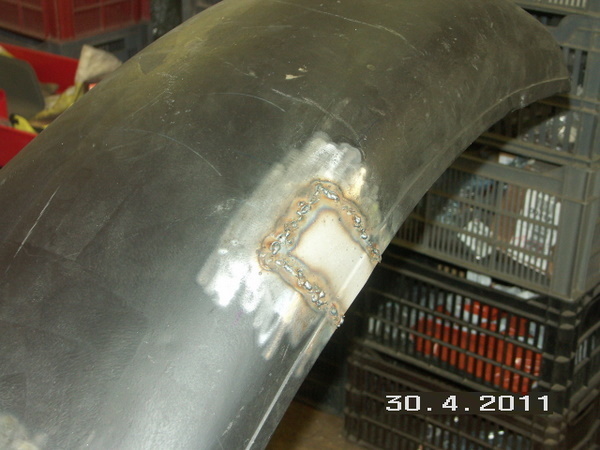 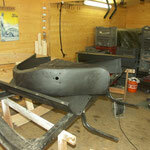 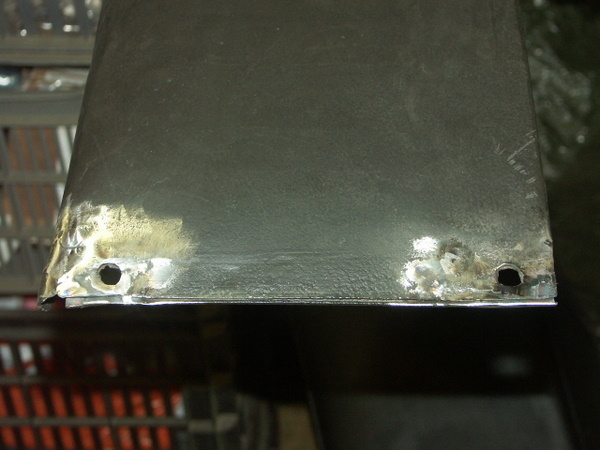 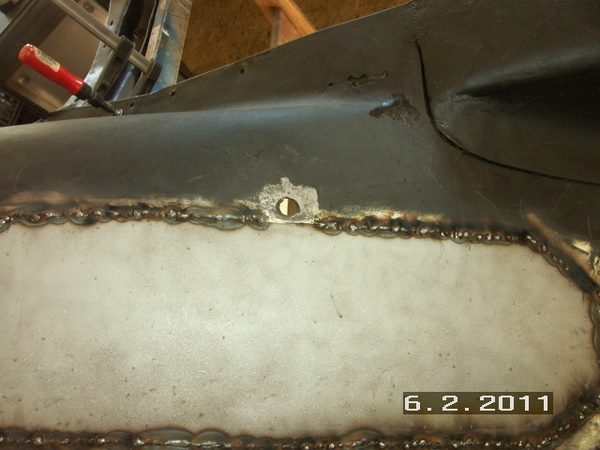 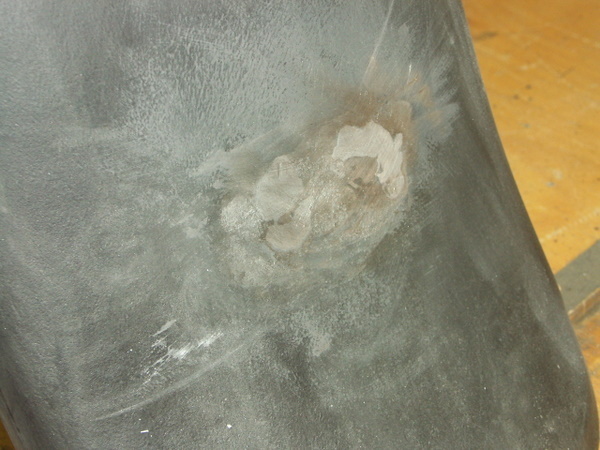 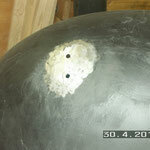 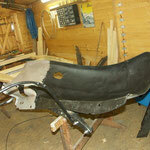 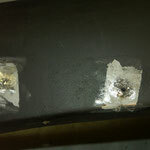 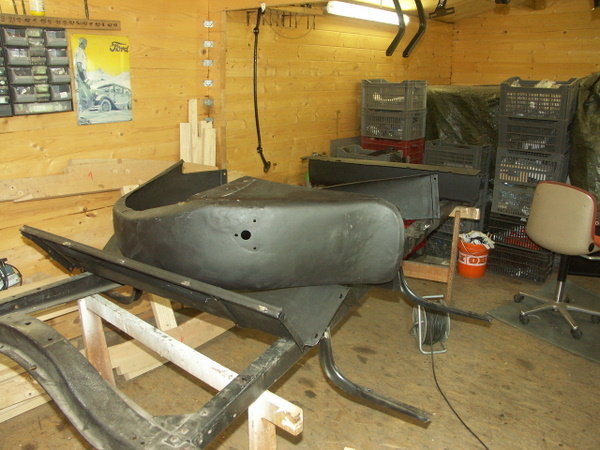 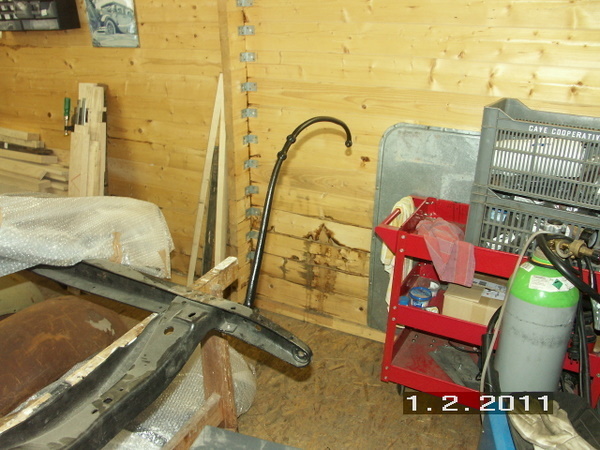 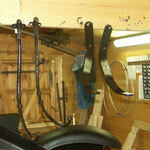 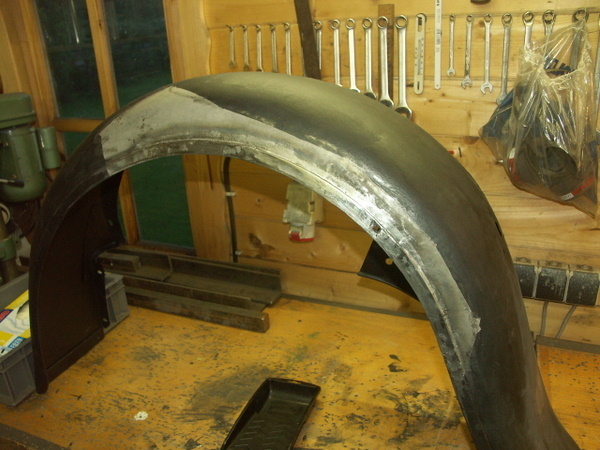 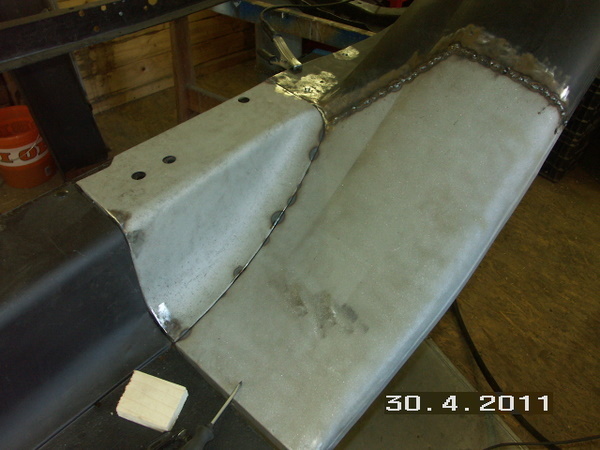 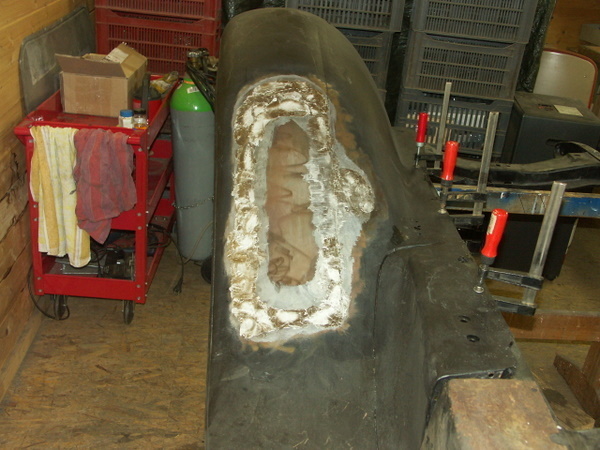 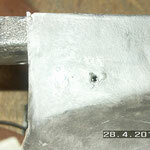 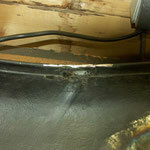 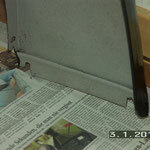 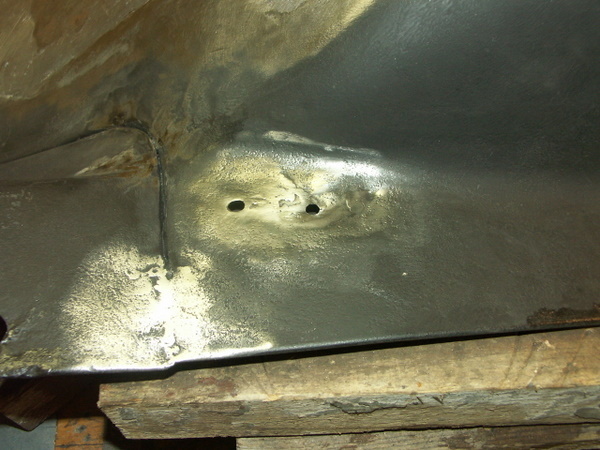 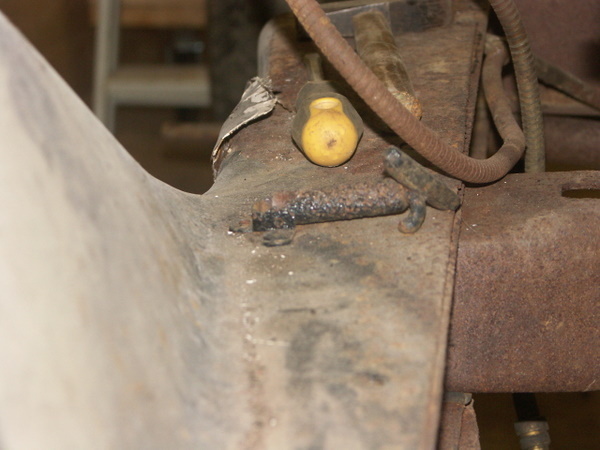 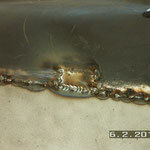 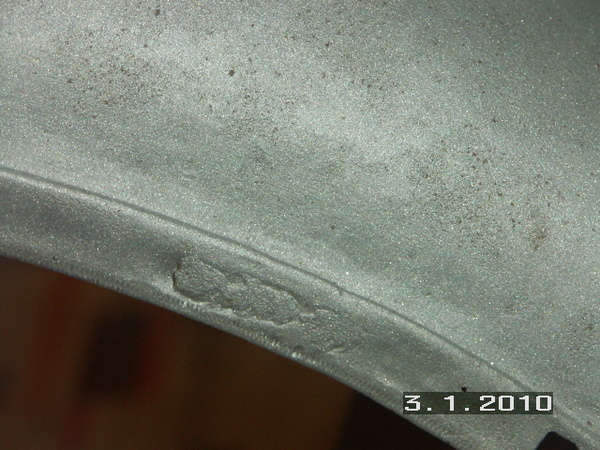 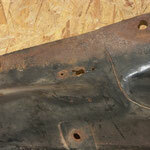 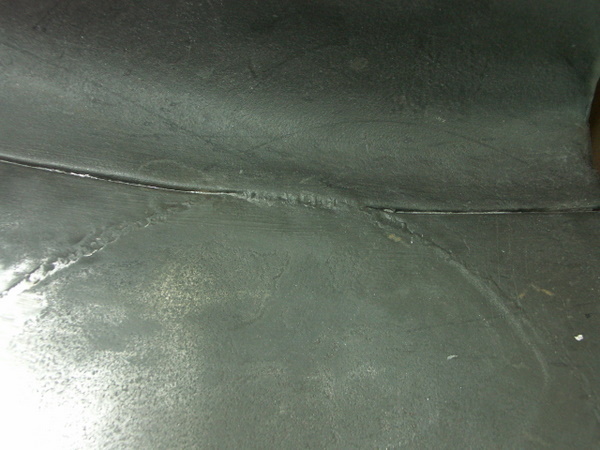 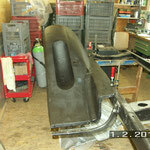 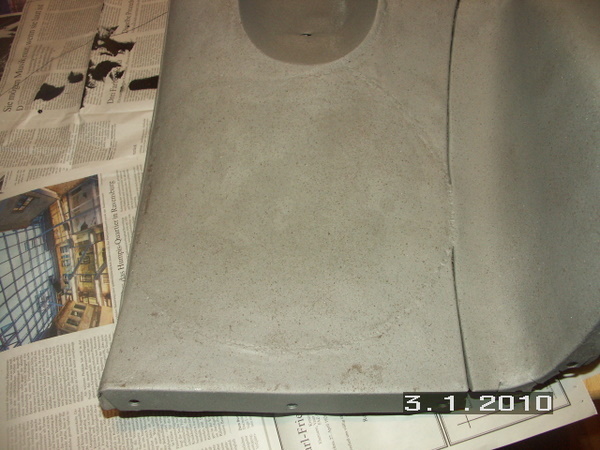 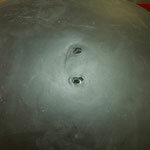 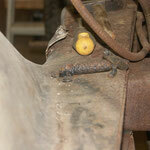 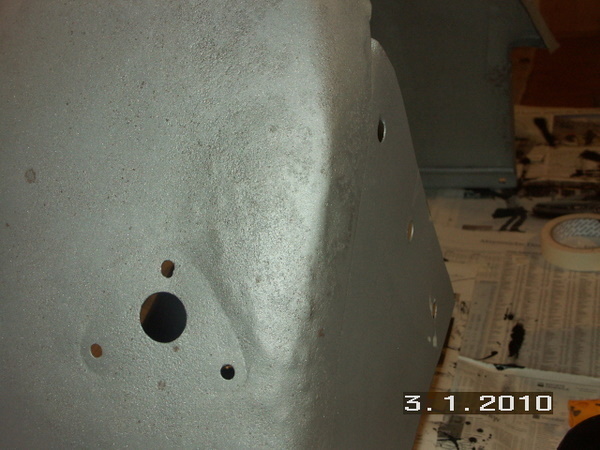 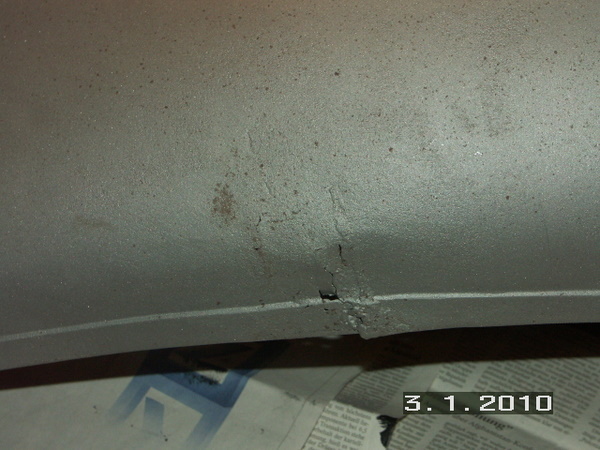 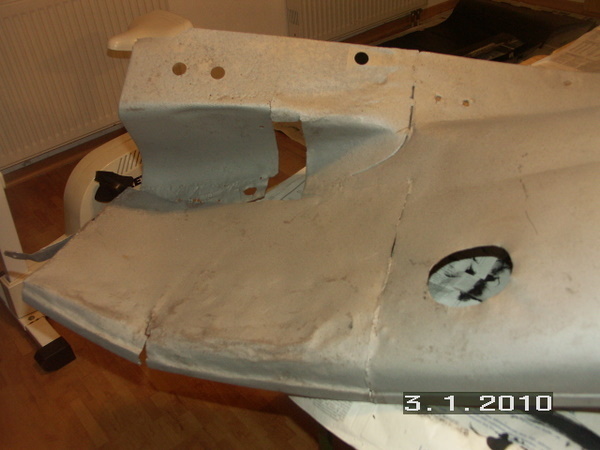 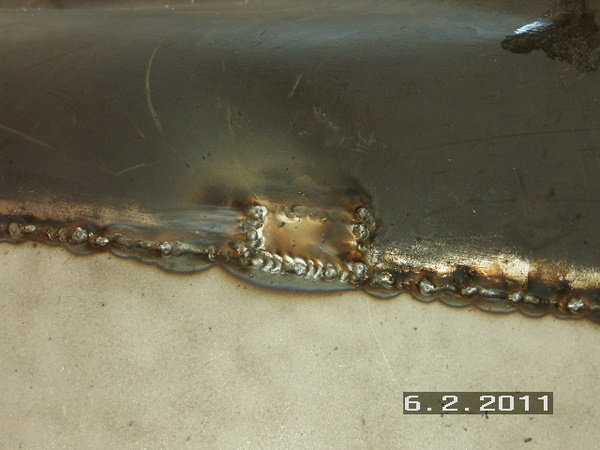 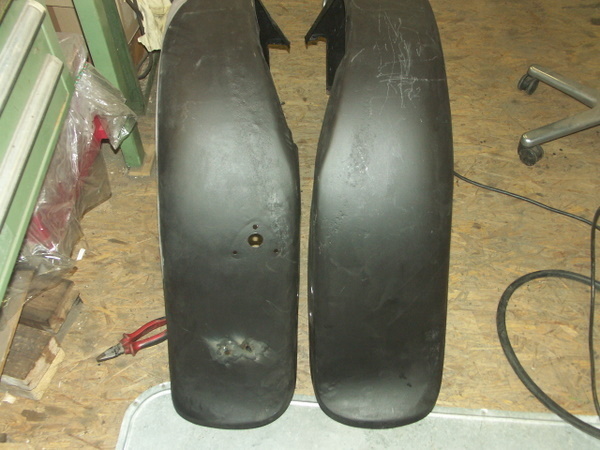 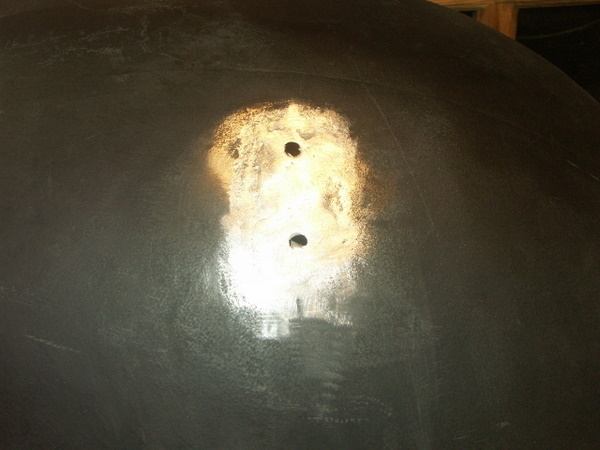 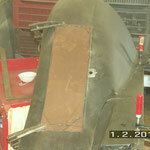 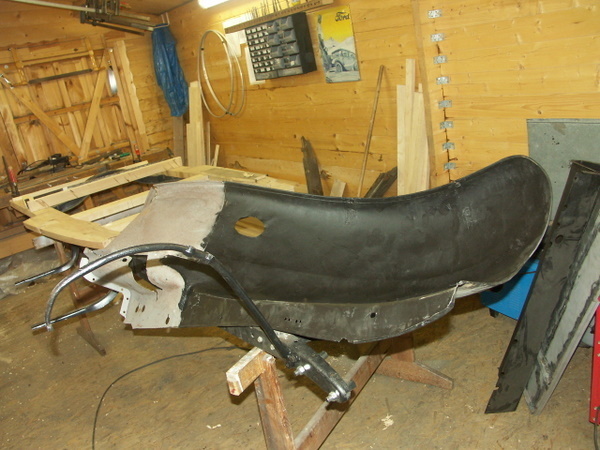 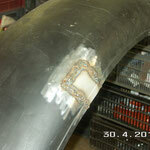 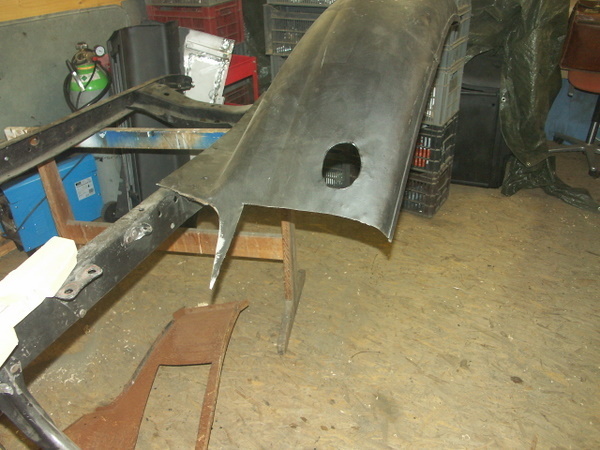 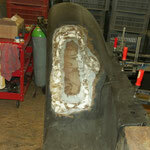 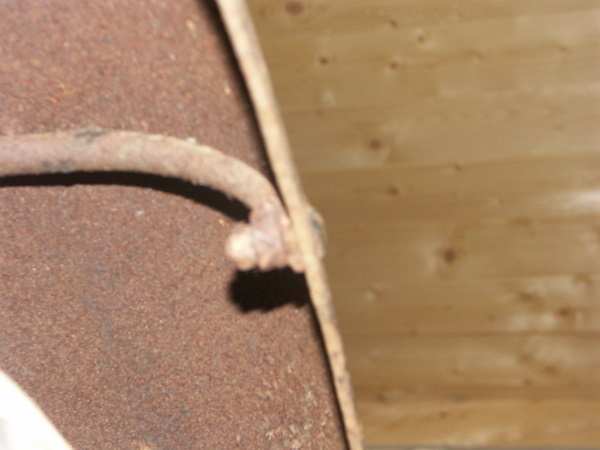 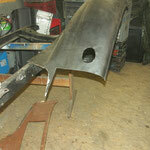 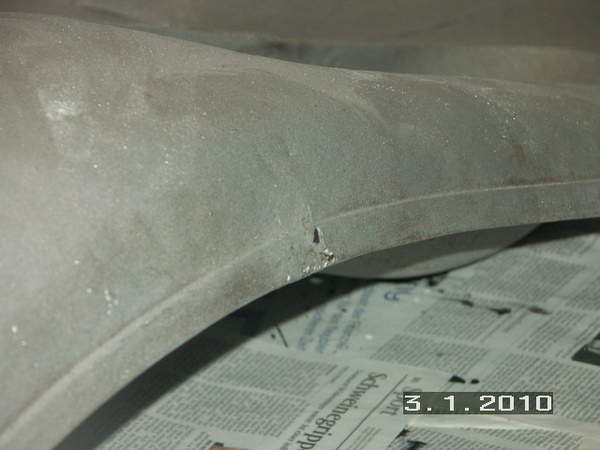 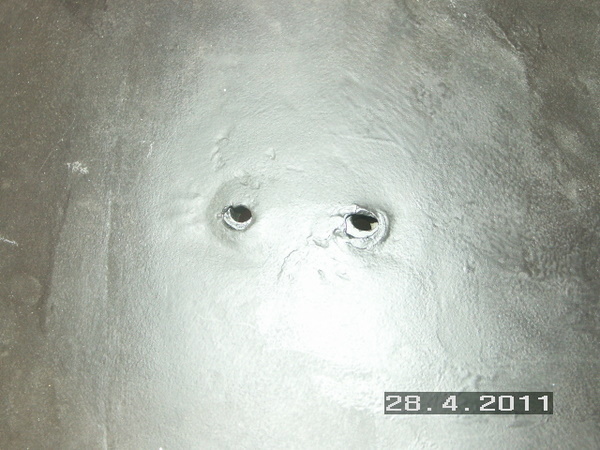 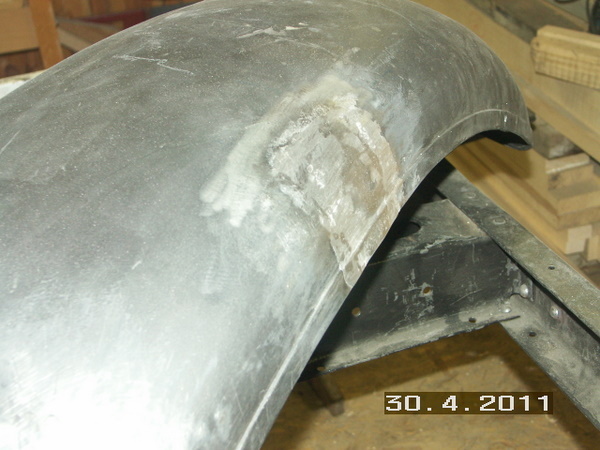 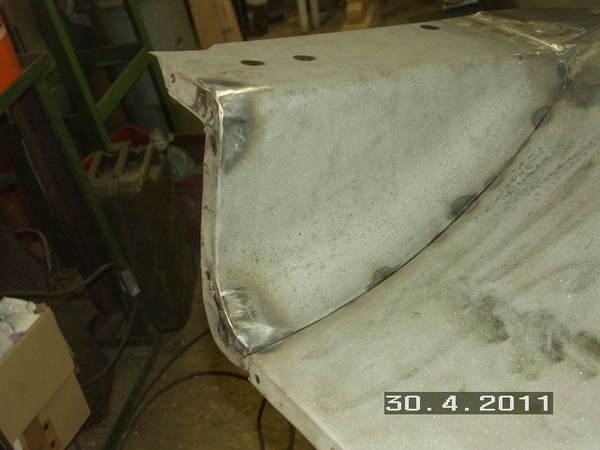 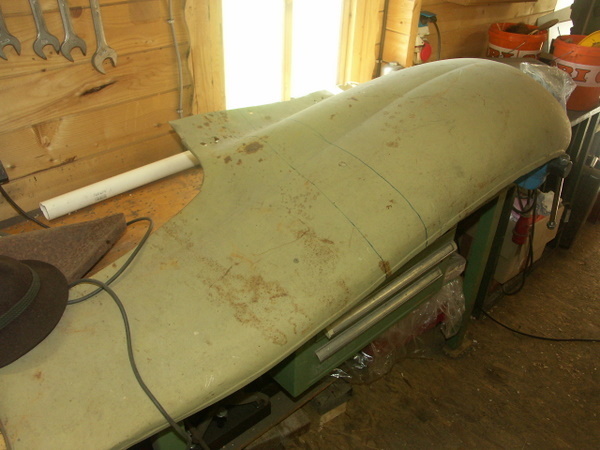 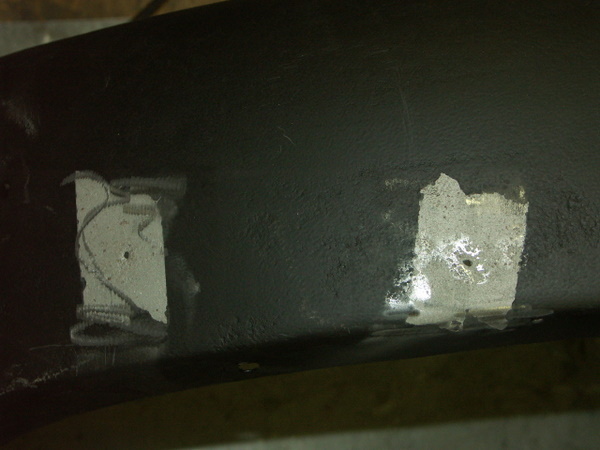 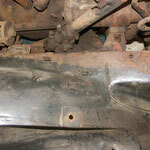 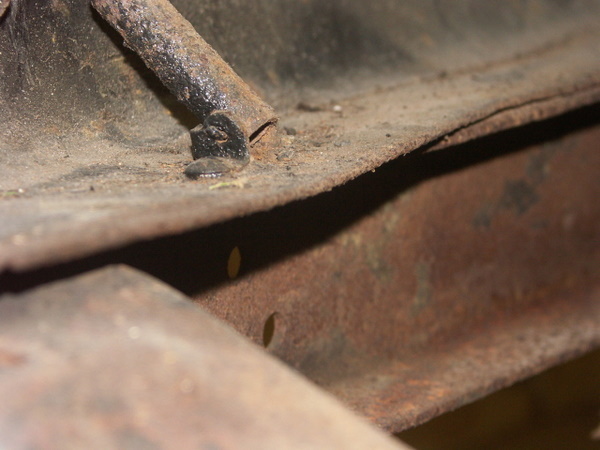 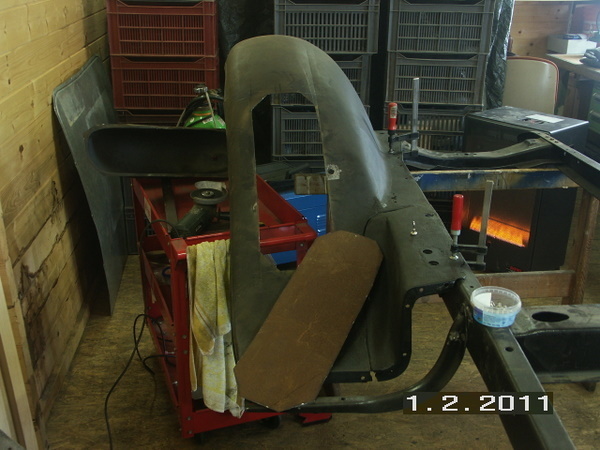 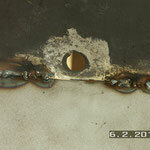 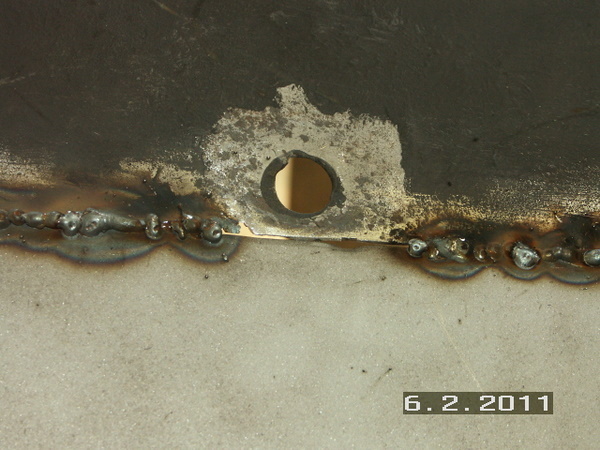 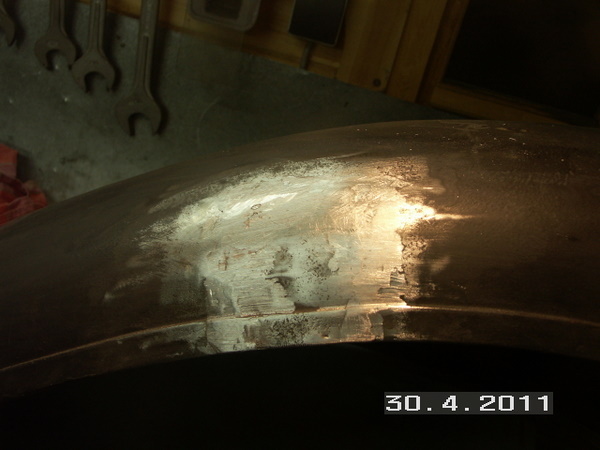 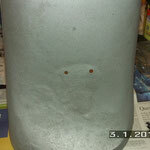 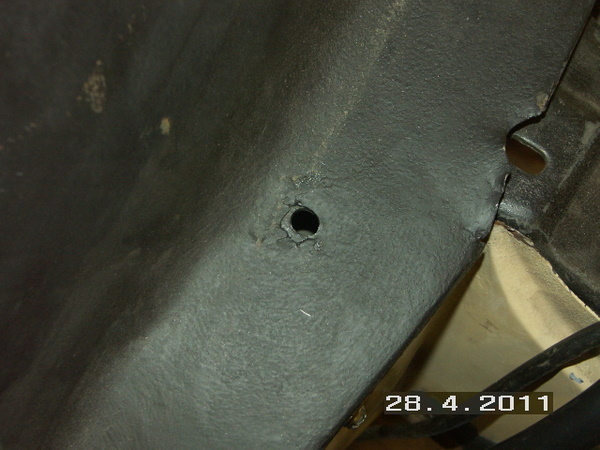 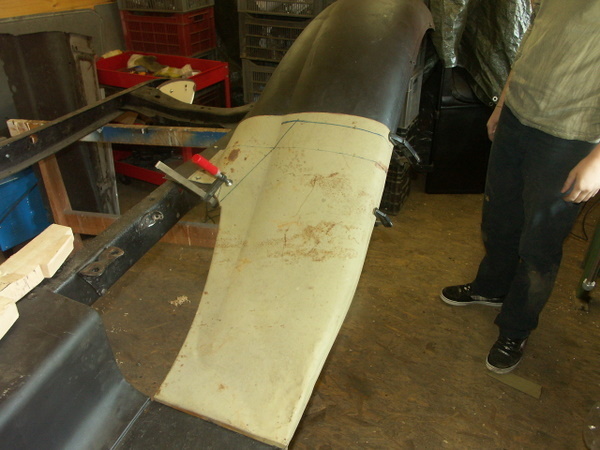 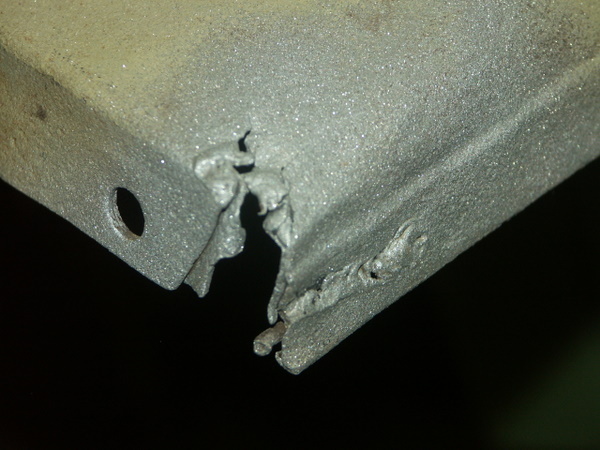 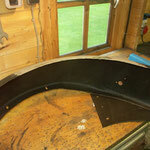 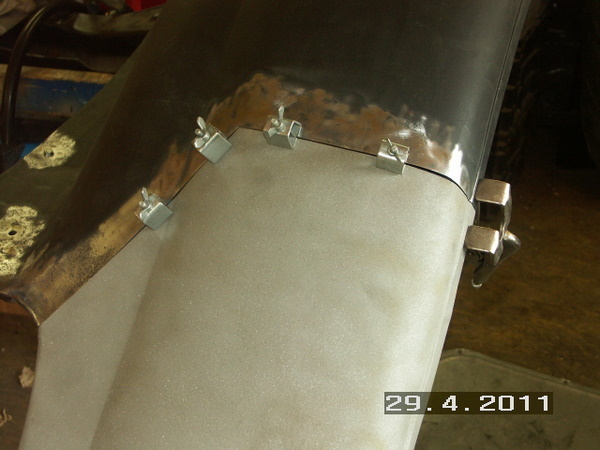 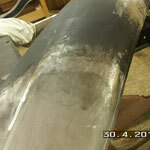 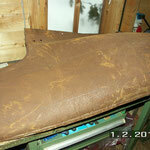 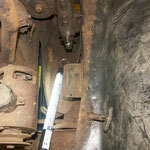 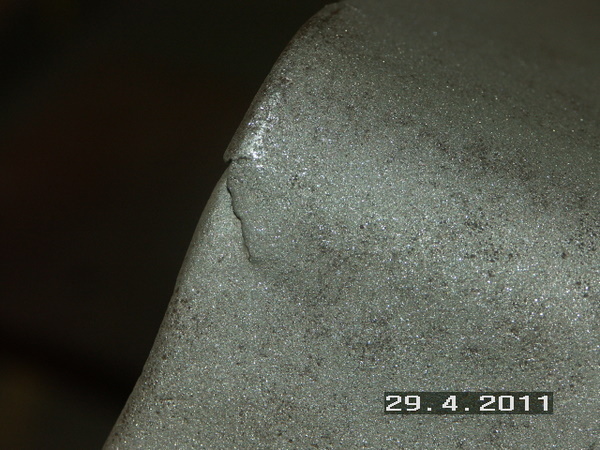 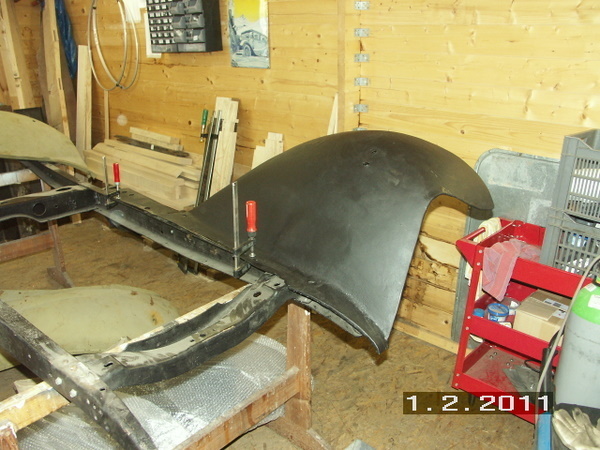 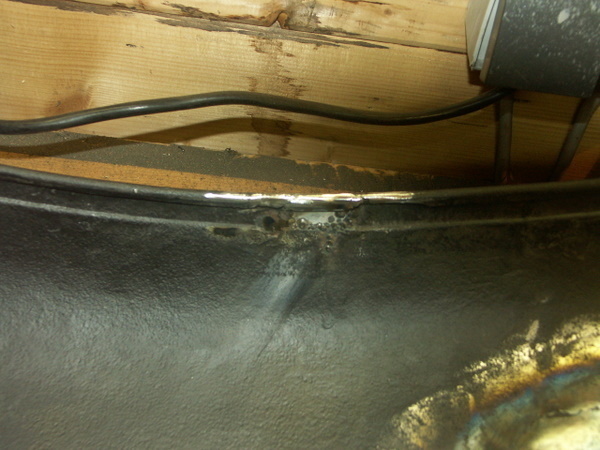 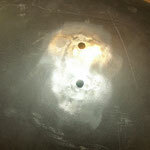 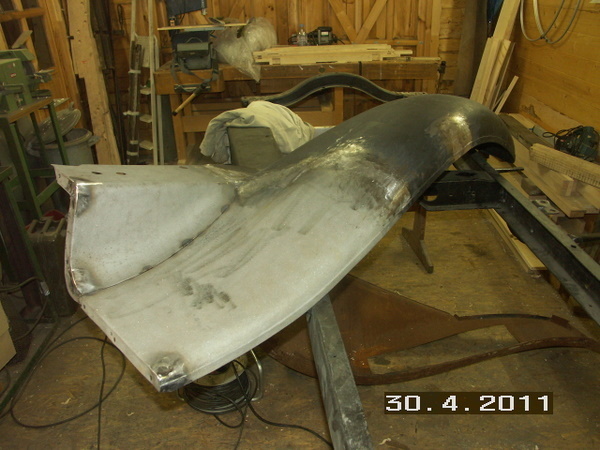 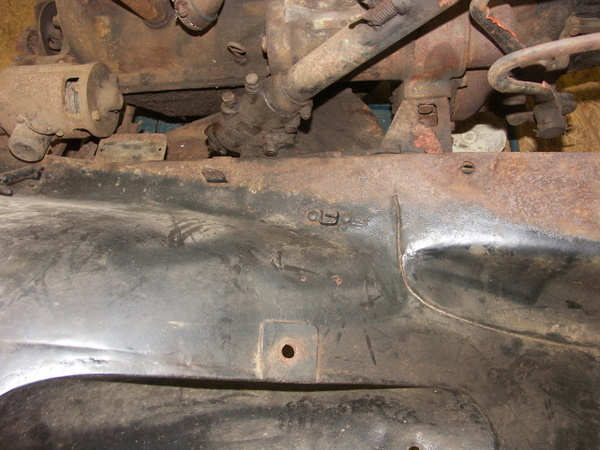 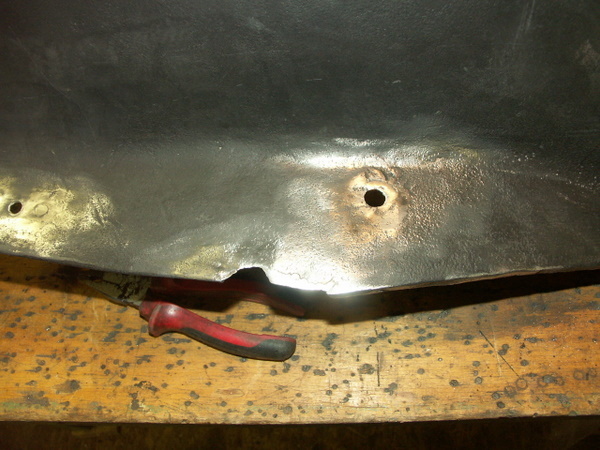 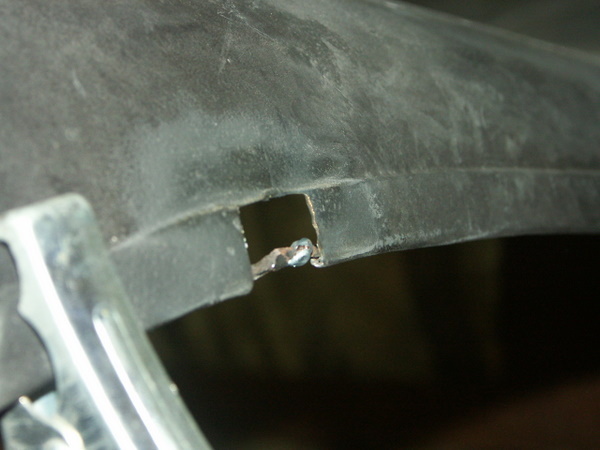 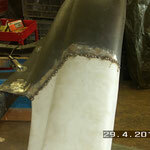 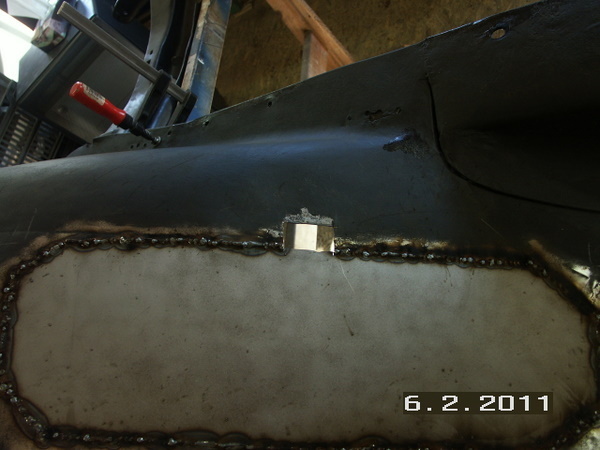 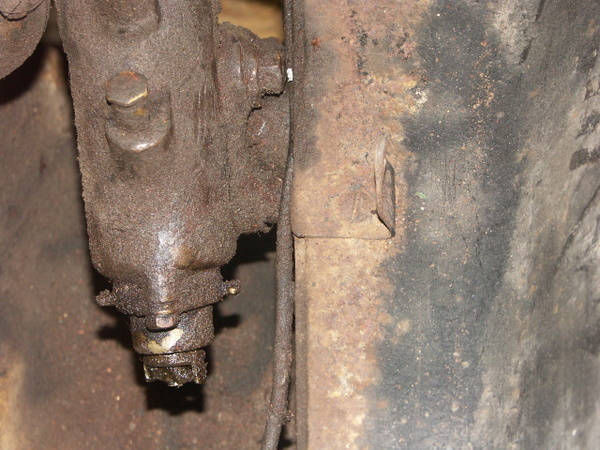 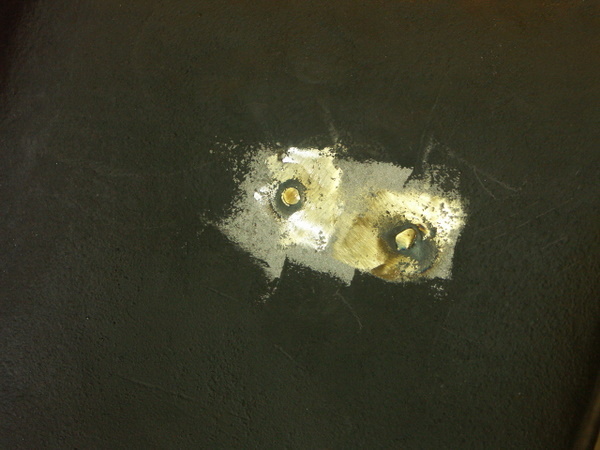 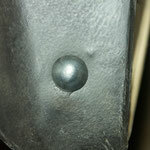 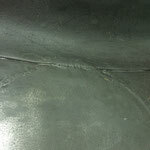 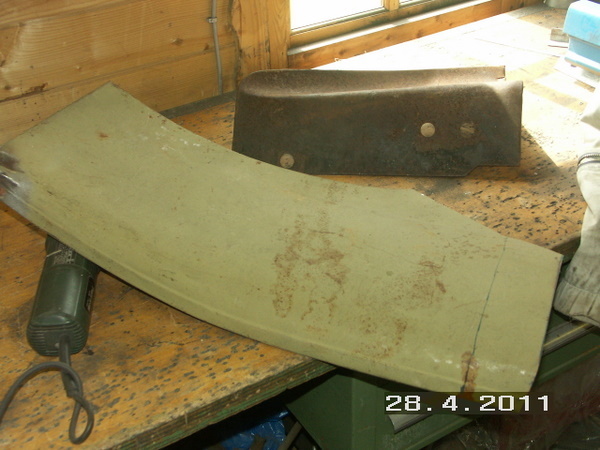 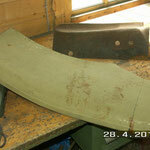 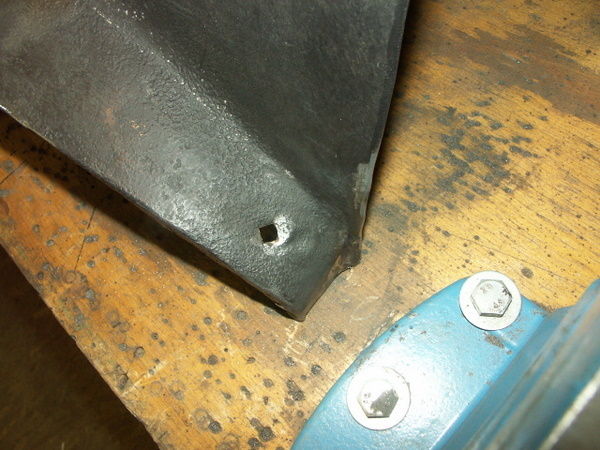 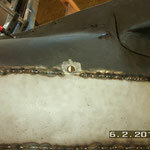 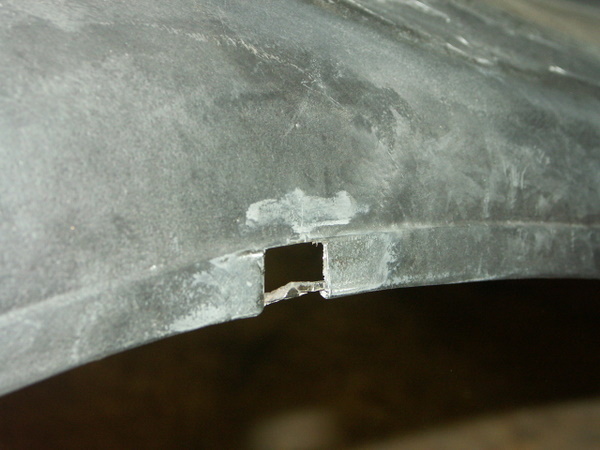 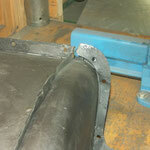 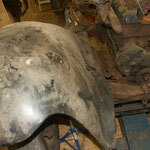 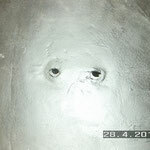 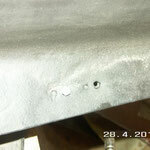 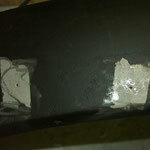 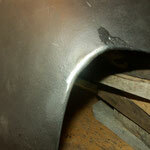 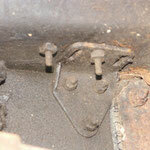 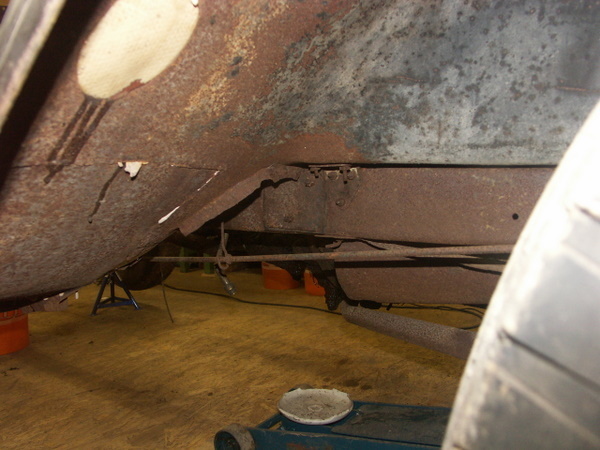 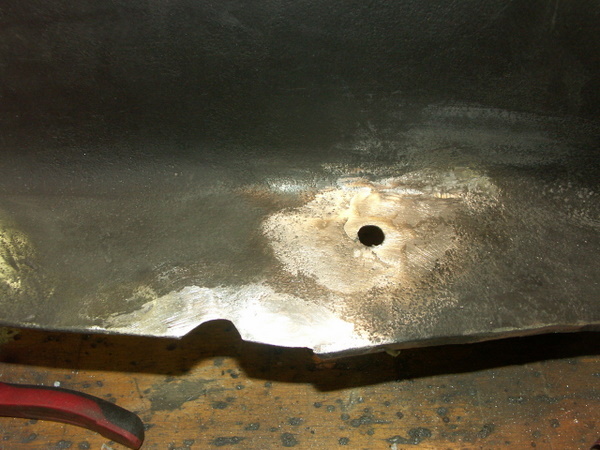 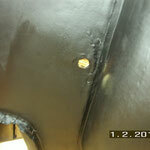 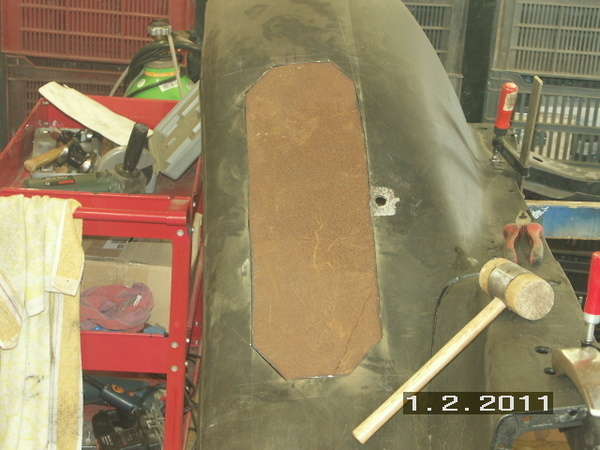 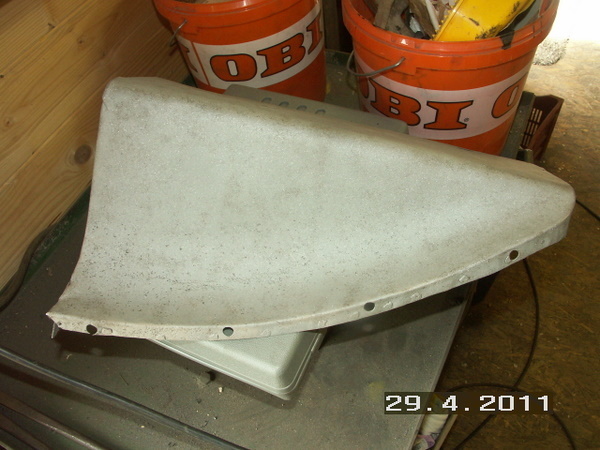 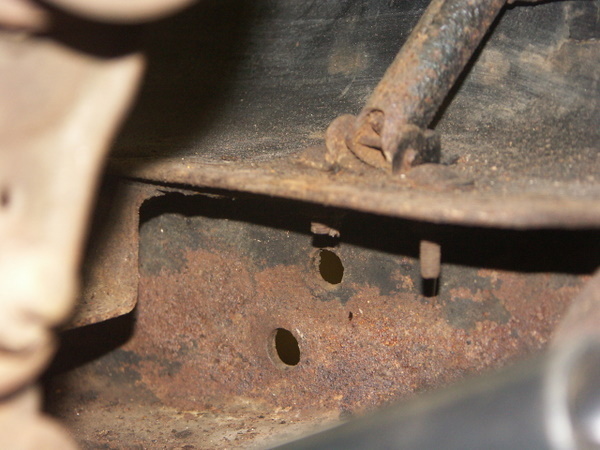 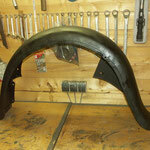 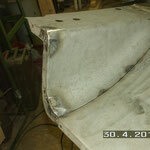 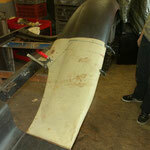 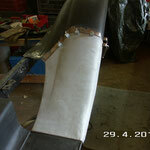 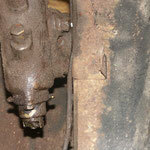 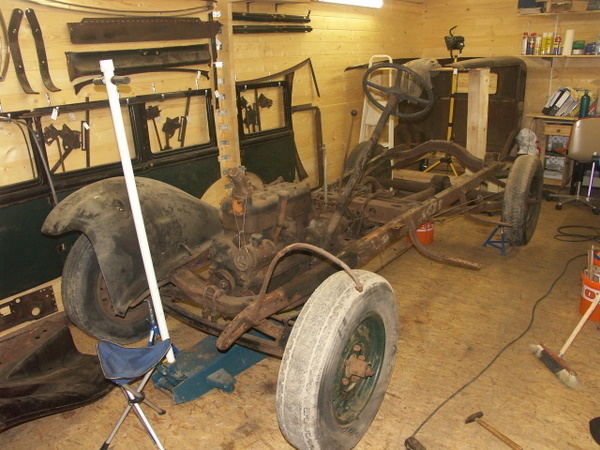 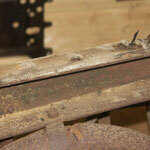 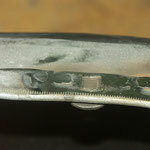 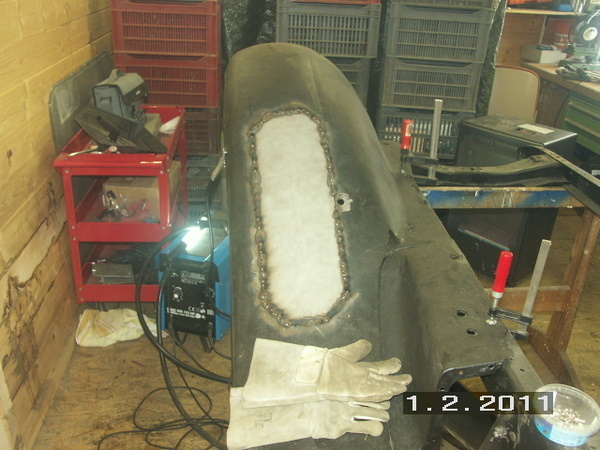 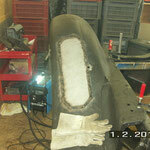 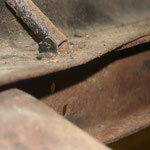 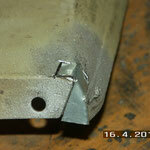 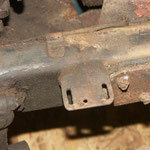 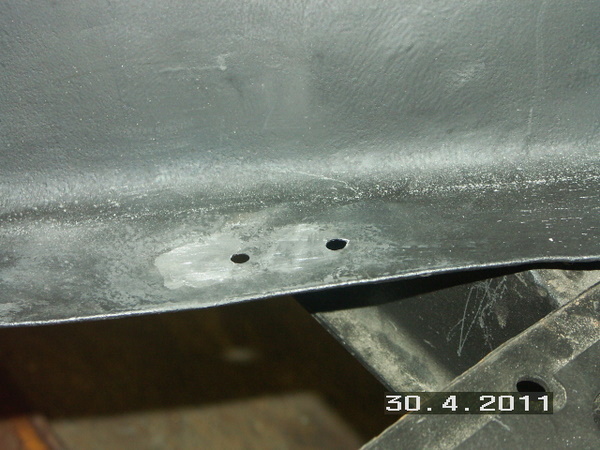 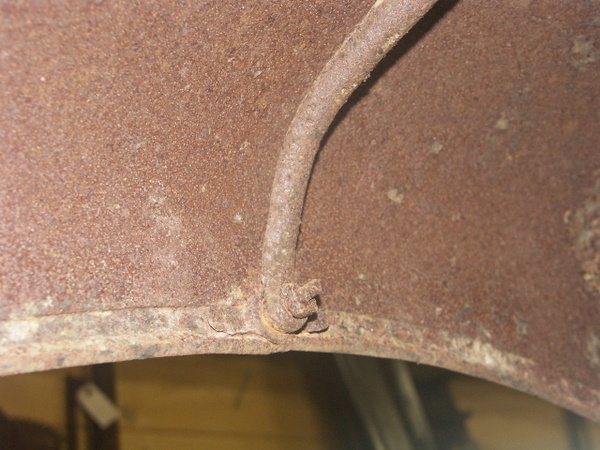 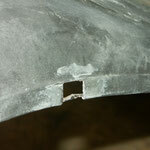 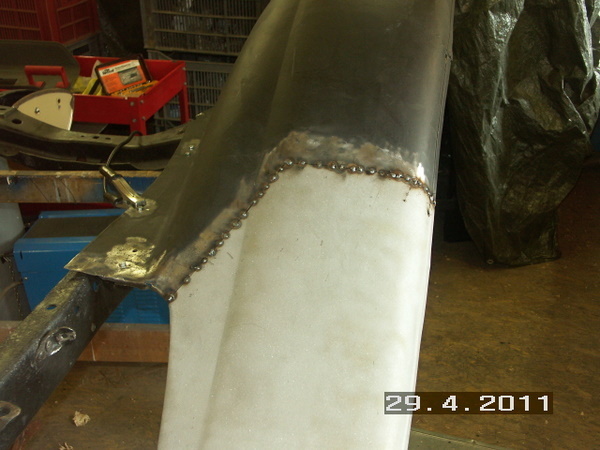 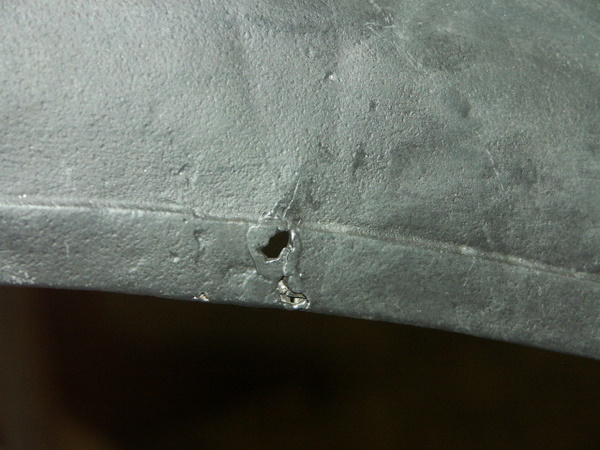 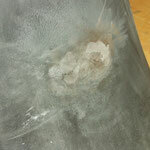 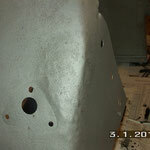 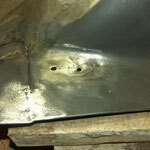 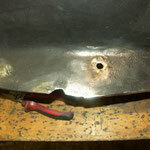 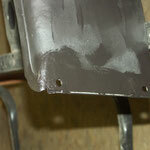 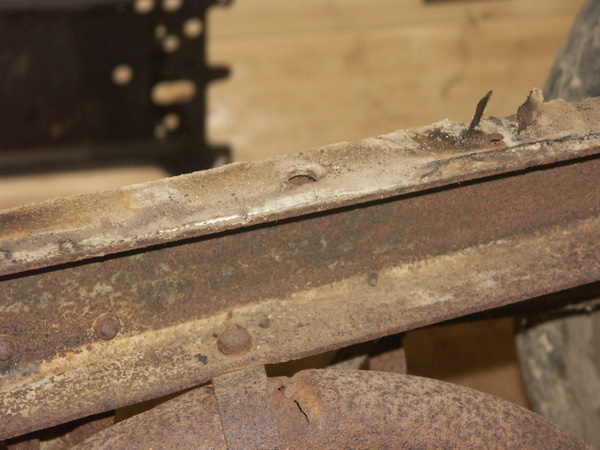 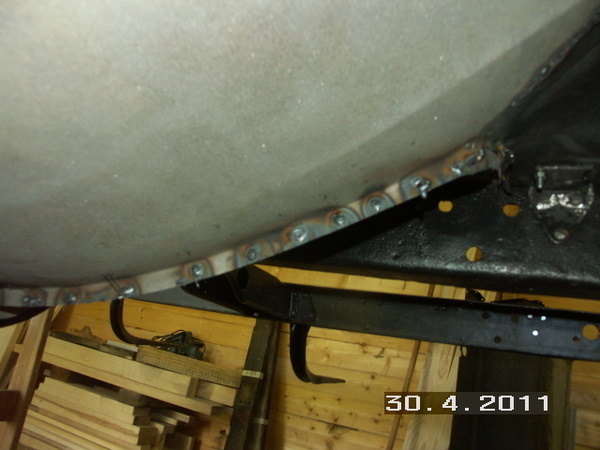 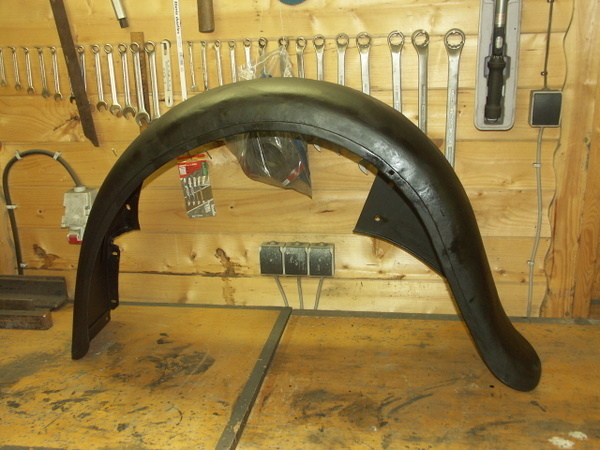 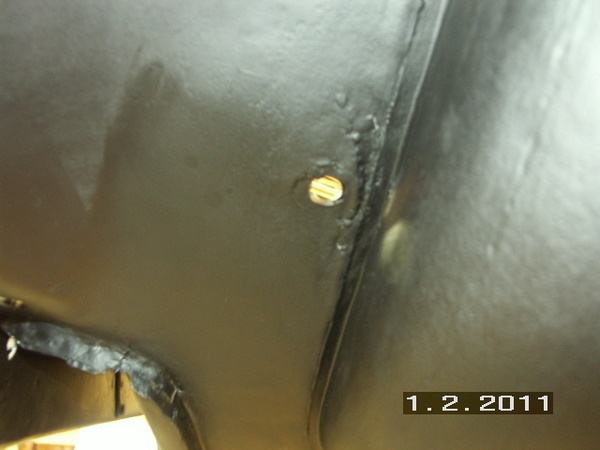 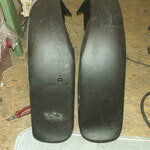 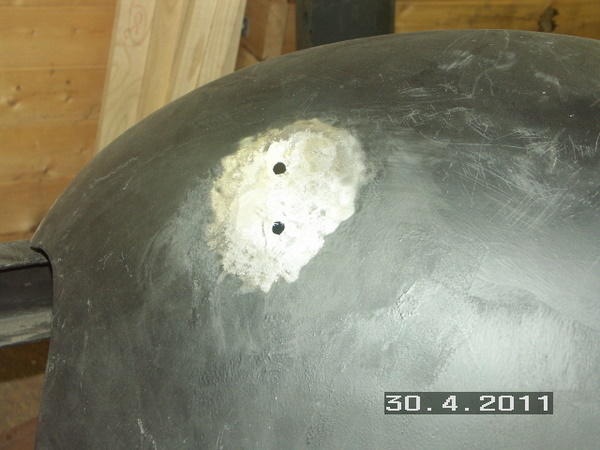 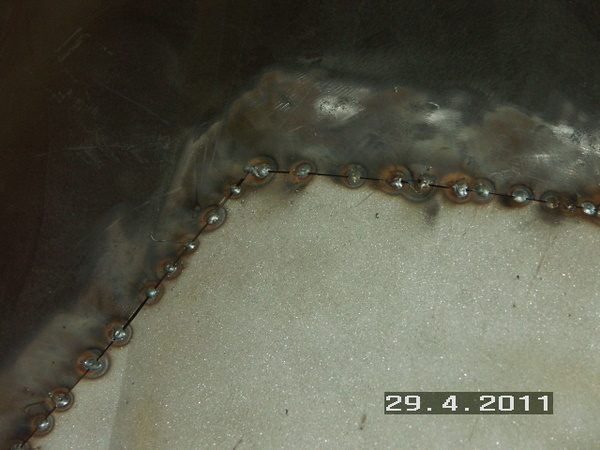 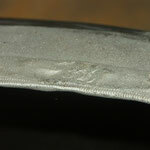 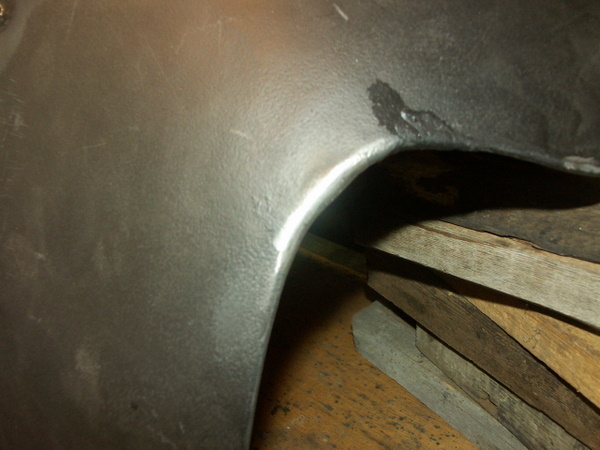 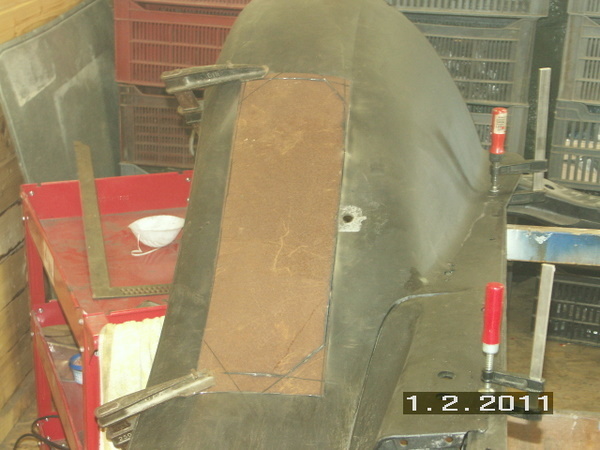 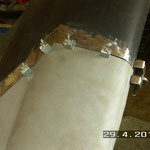 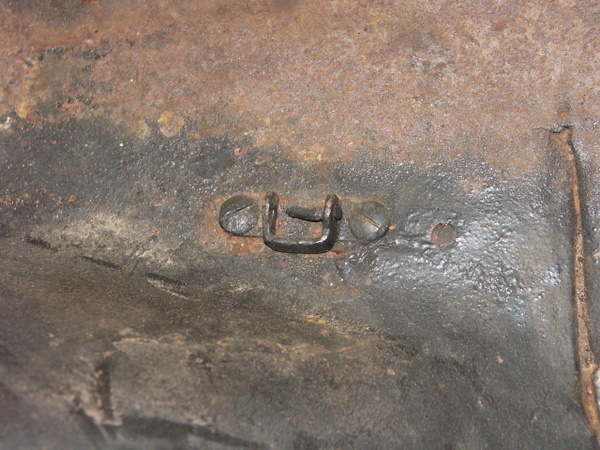 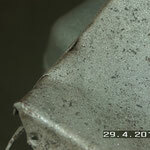 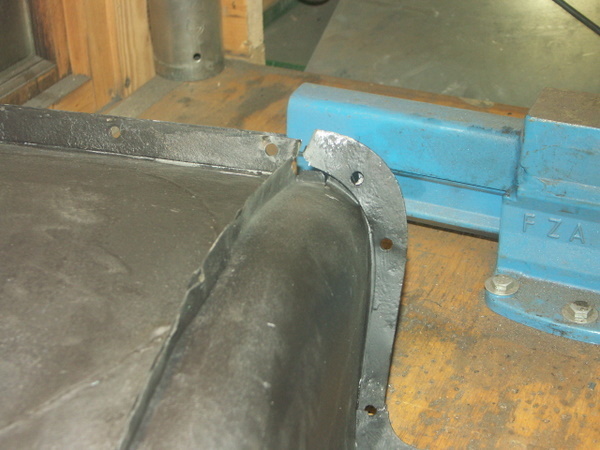 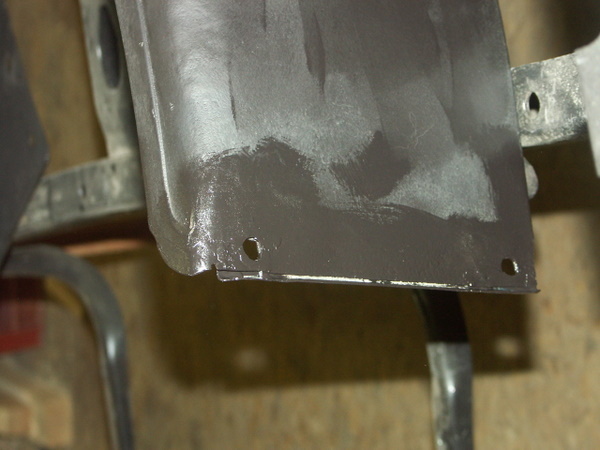 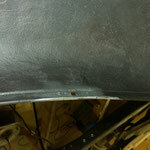 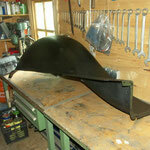 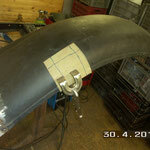 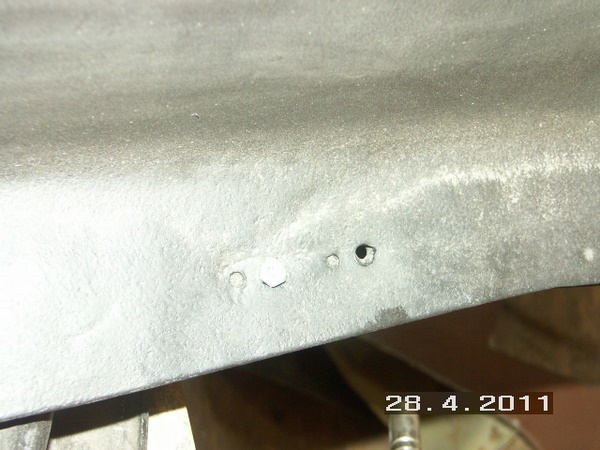 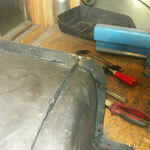 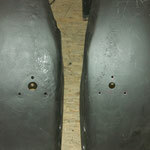 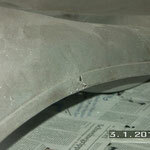 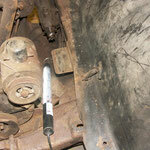 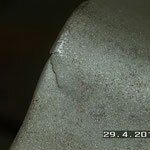 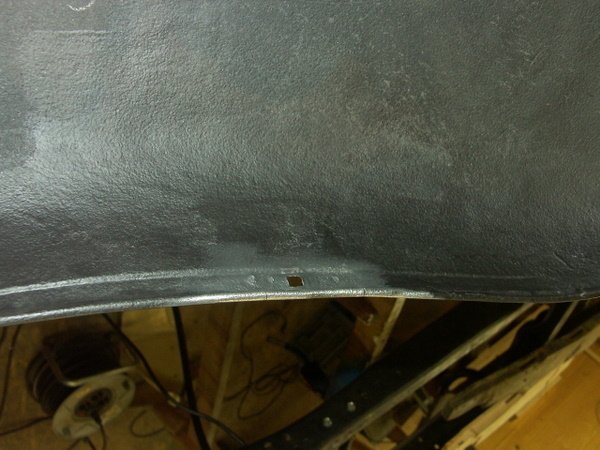 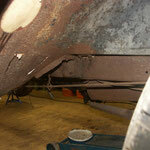 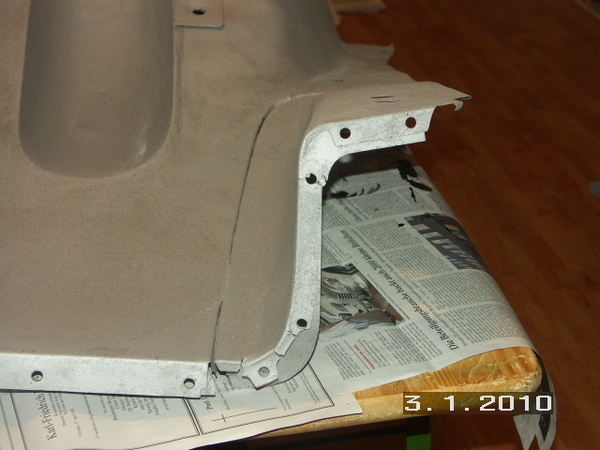 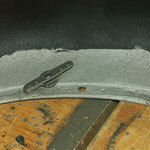 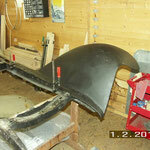 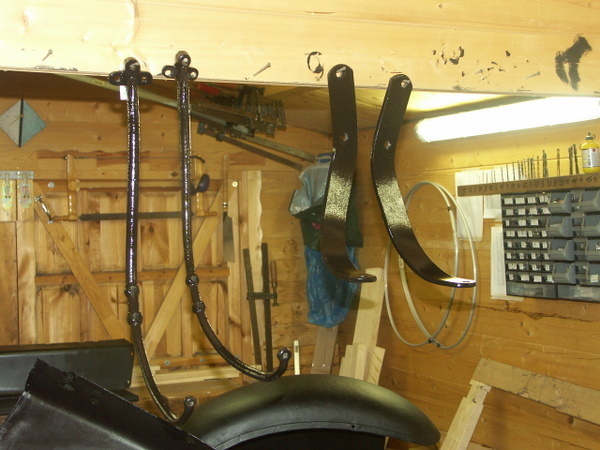 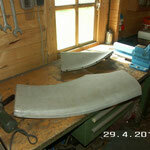 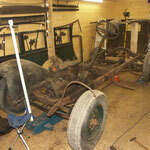 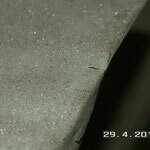 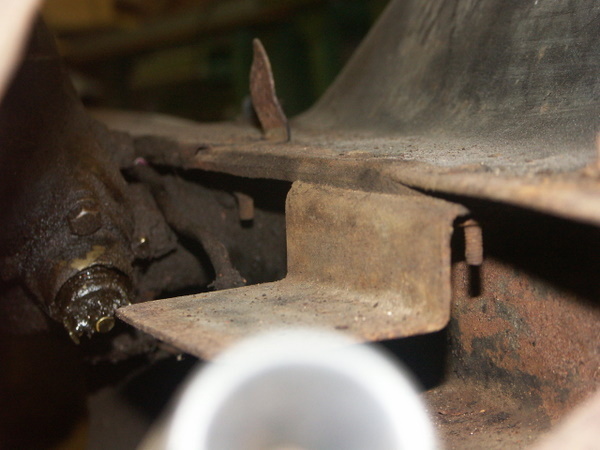 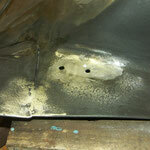 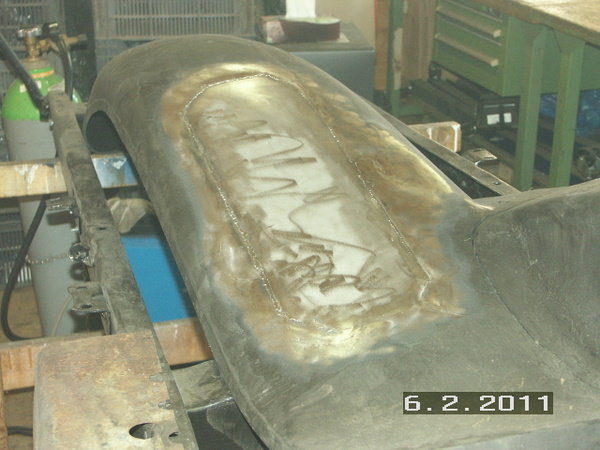 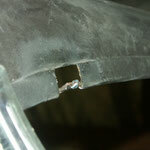 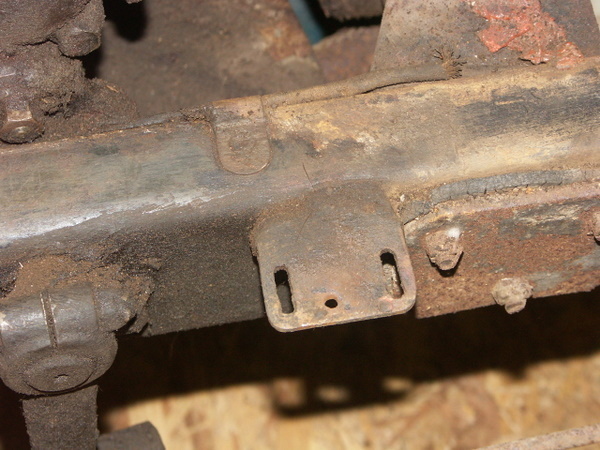 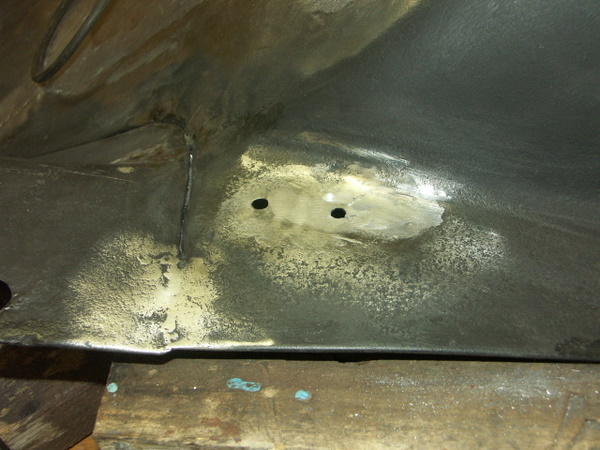 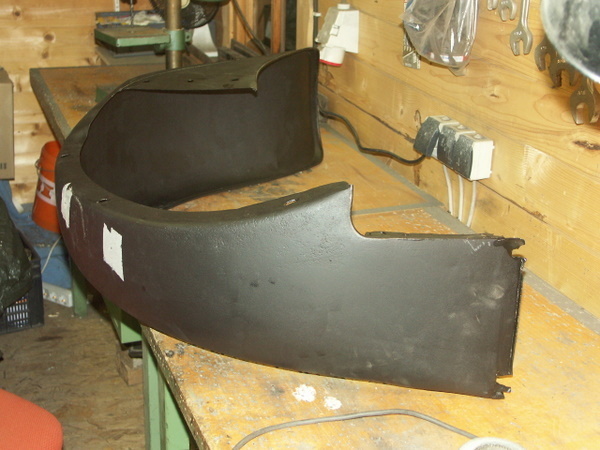 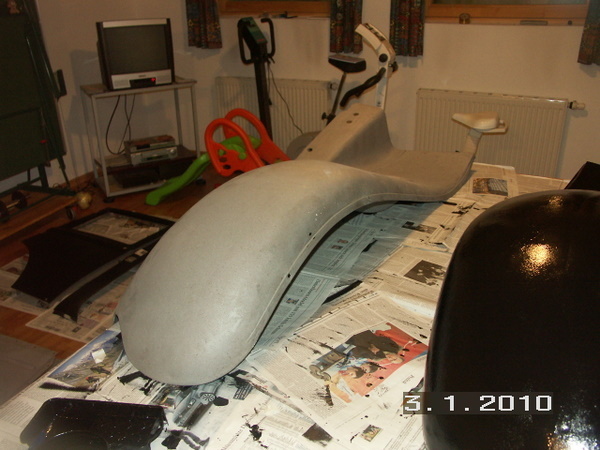 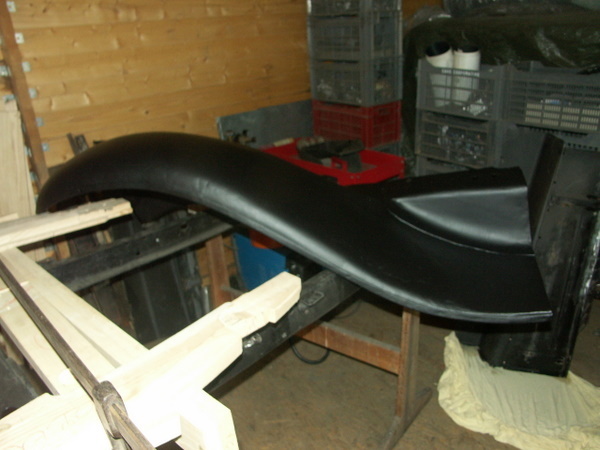 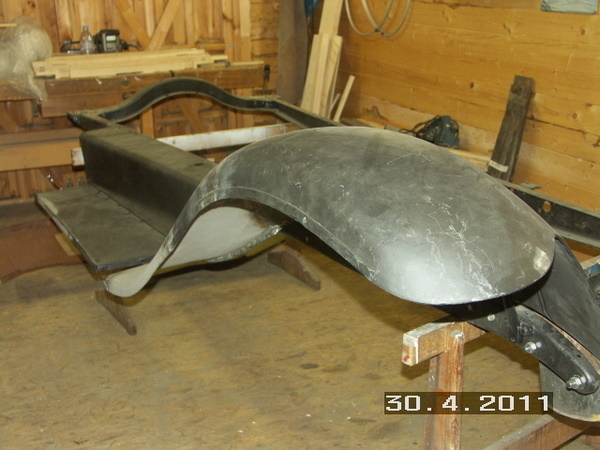 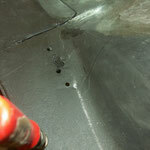 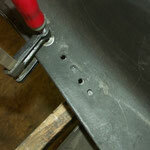 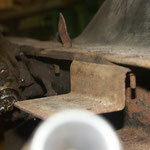 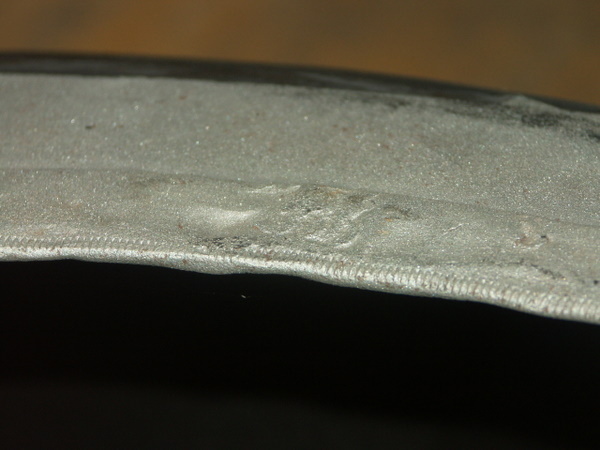 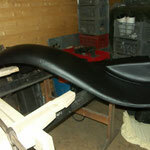 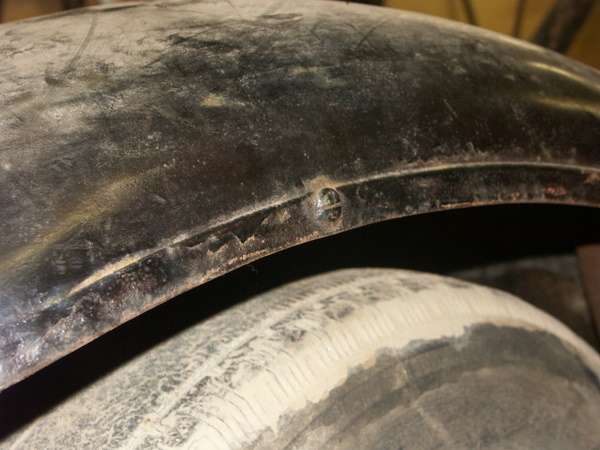 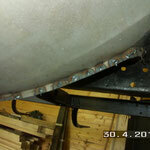 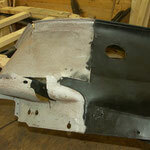 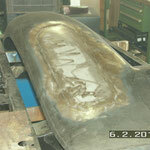 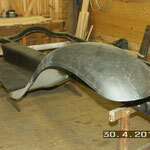 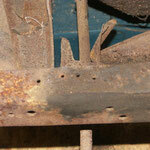 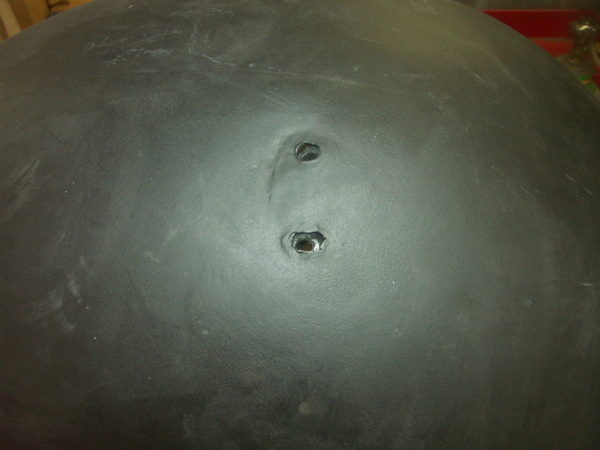 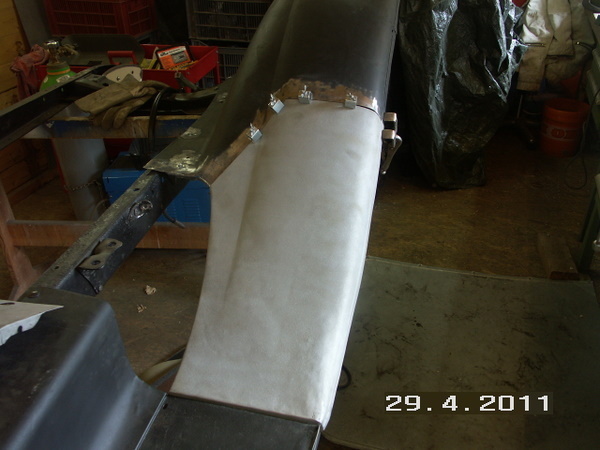 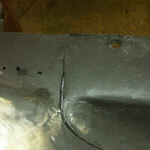 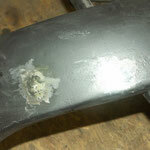 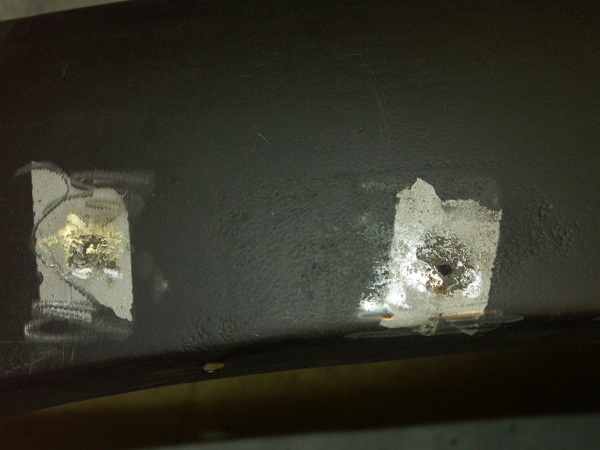 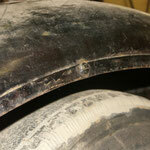 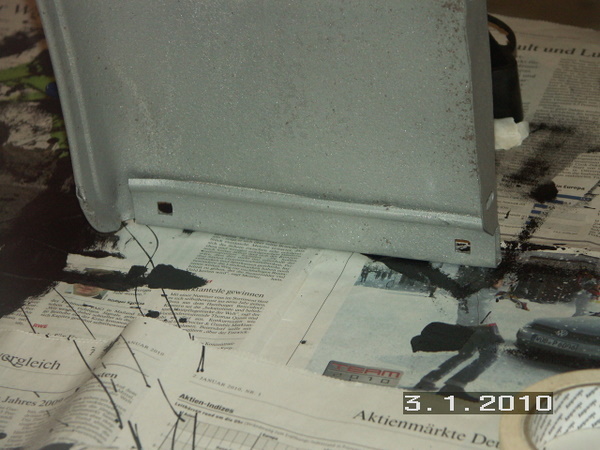 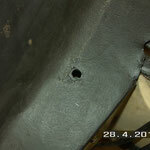 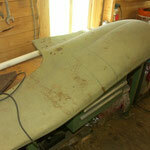 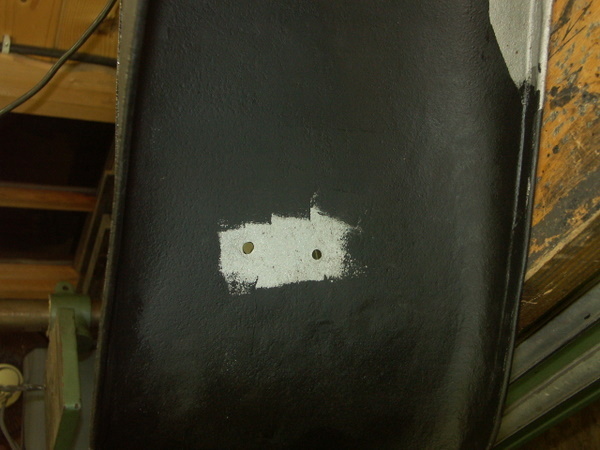 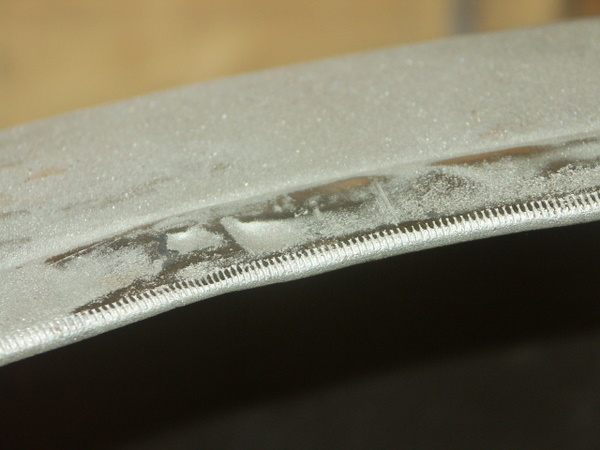 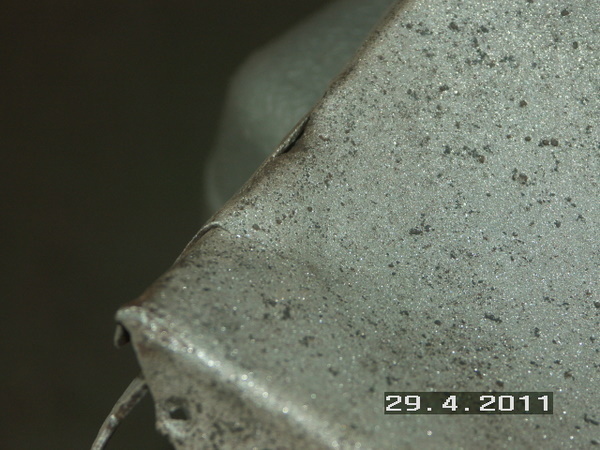 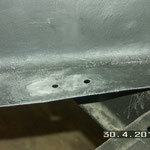 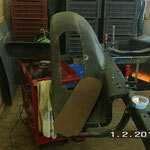 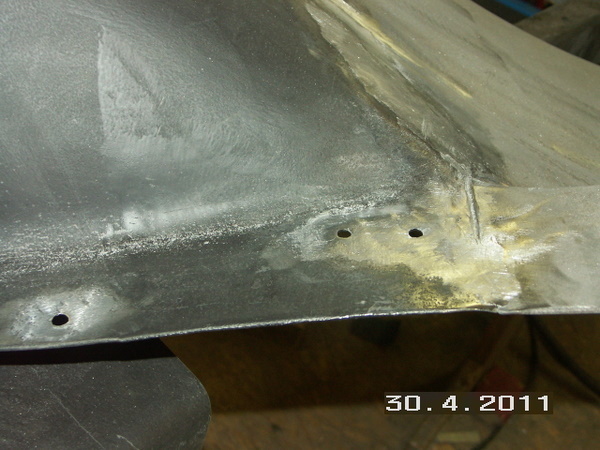 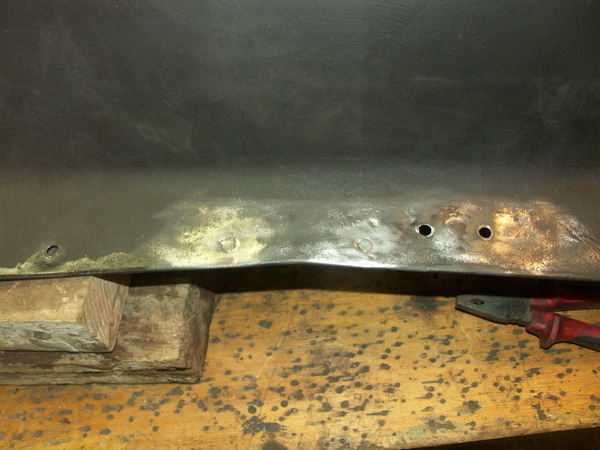 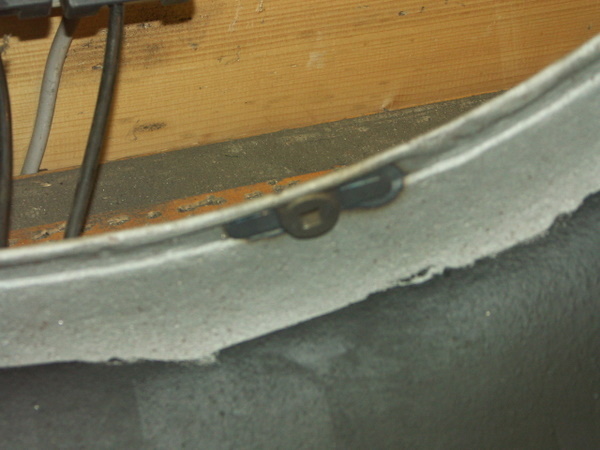 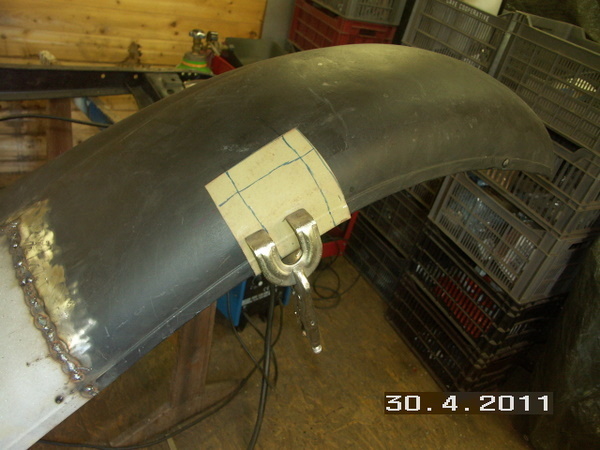 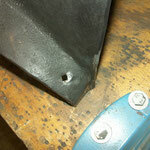 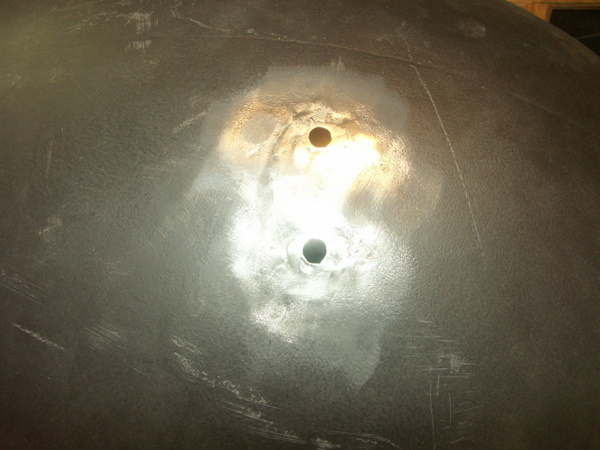 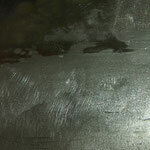 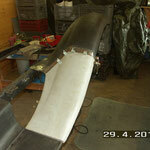 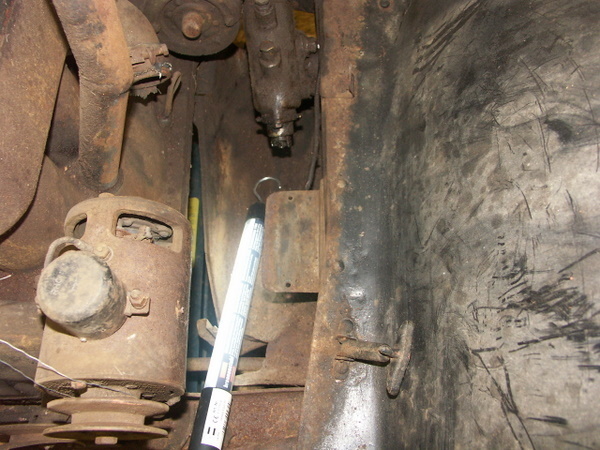 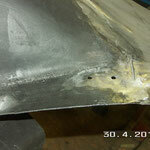 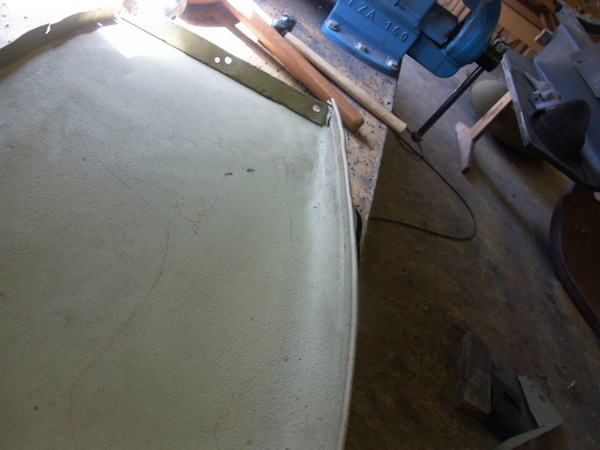 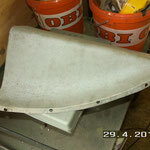 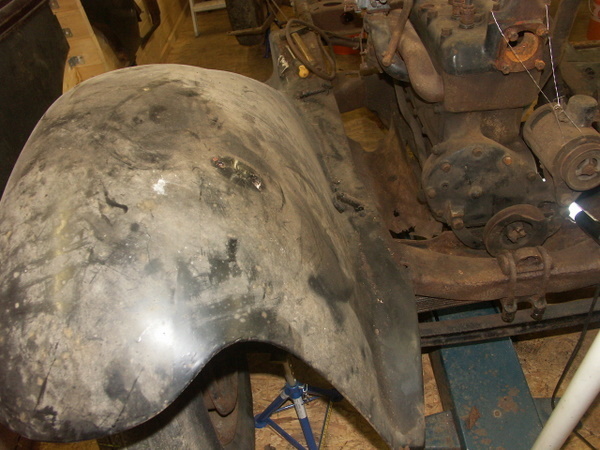 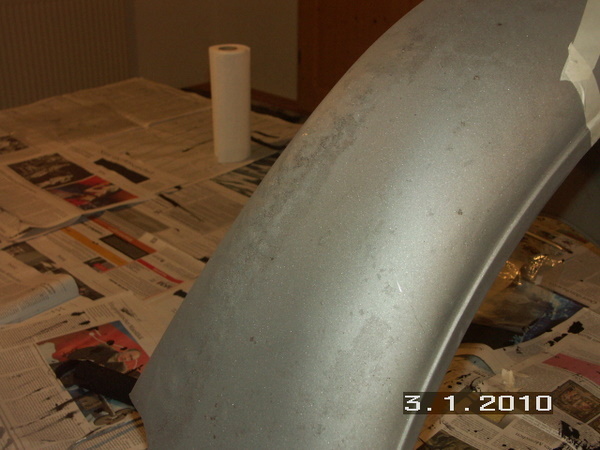 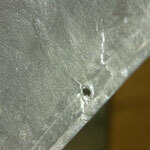 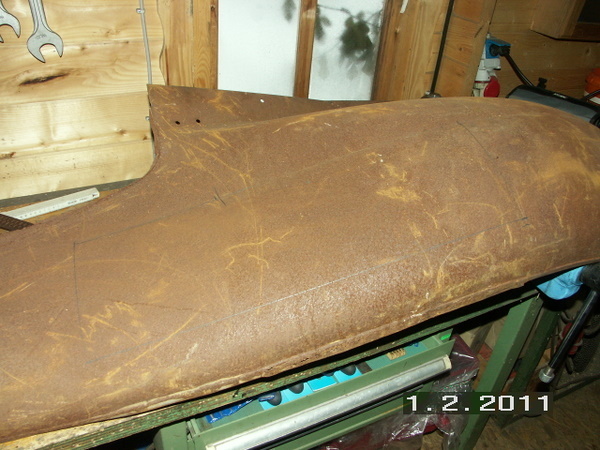 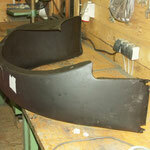 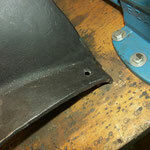 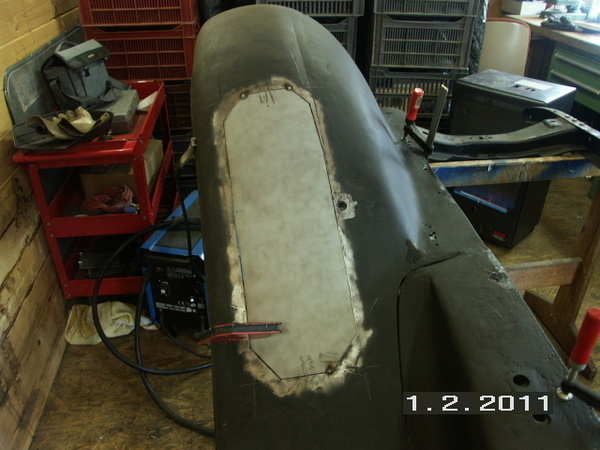 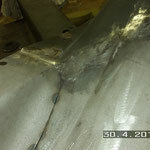 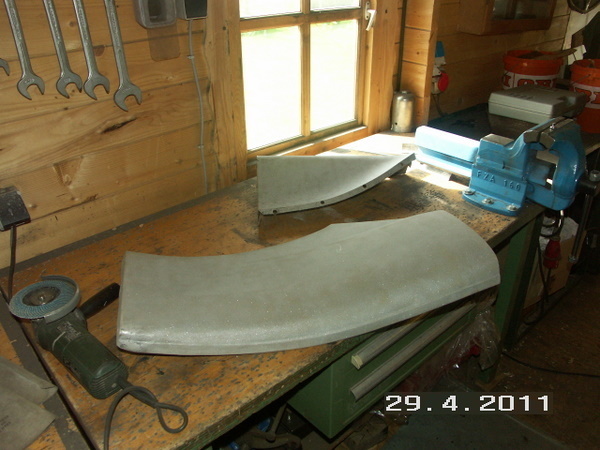 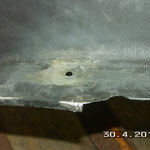 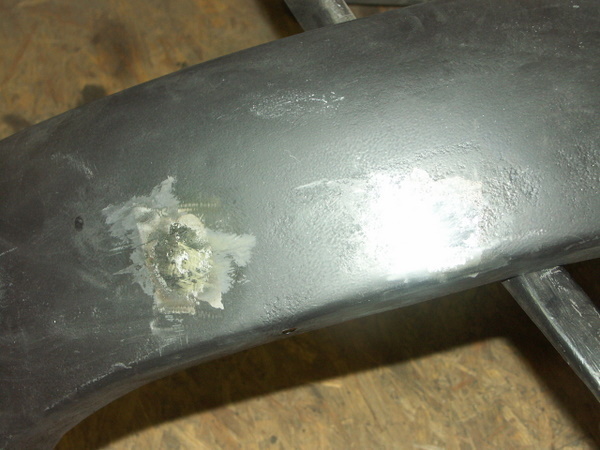 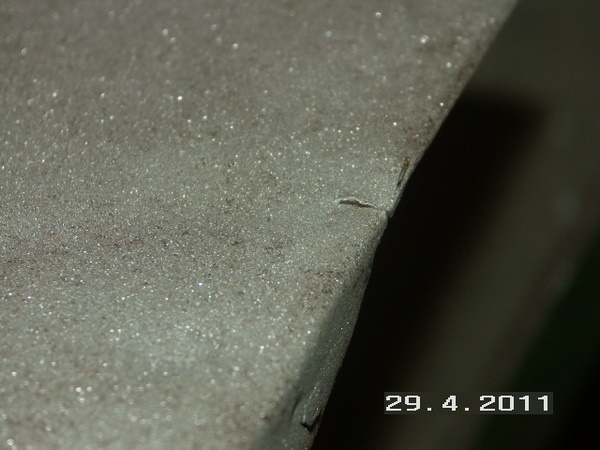 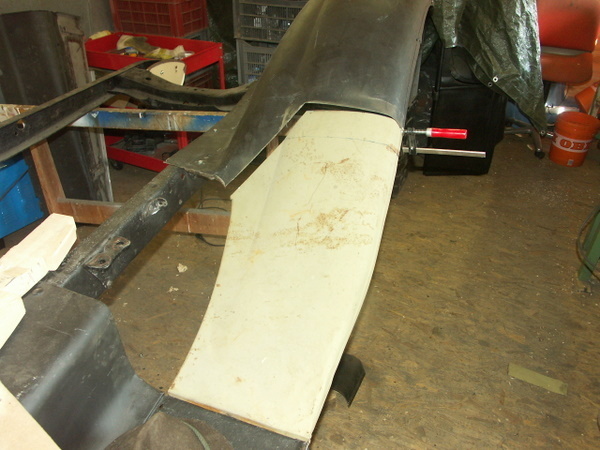 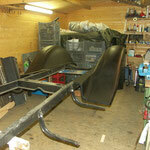 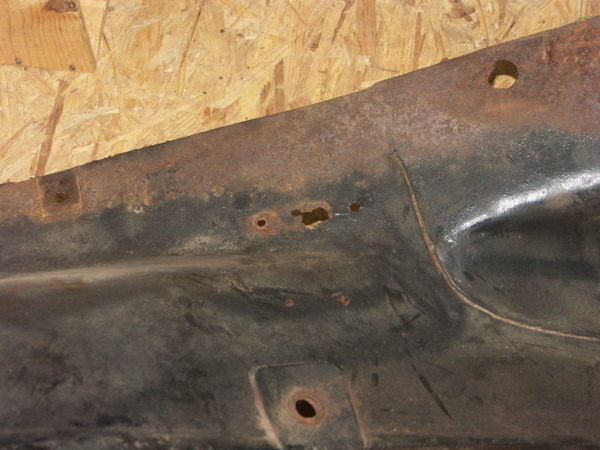 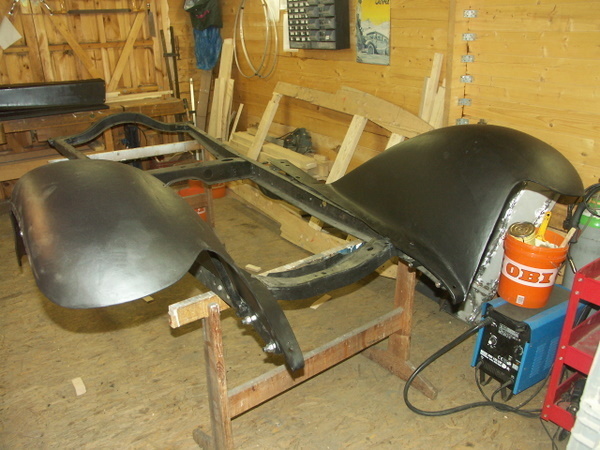 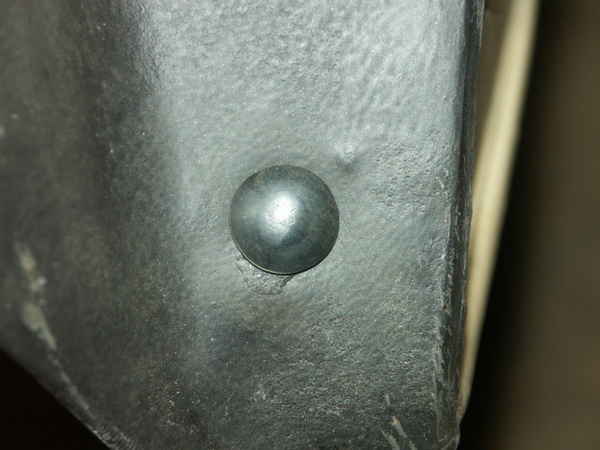 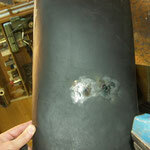 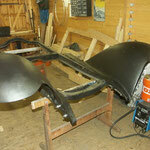 The front fenders were in a very bad condition, as part of the right hand fenders were romoved to gain space for a gas tank for a wood gas generator. 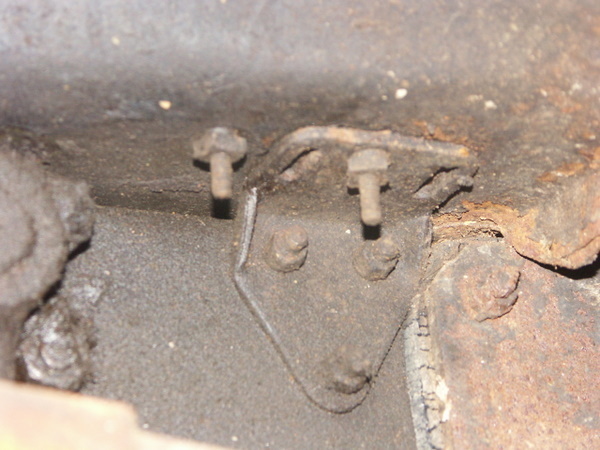 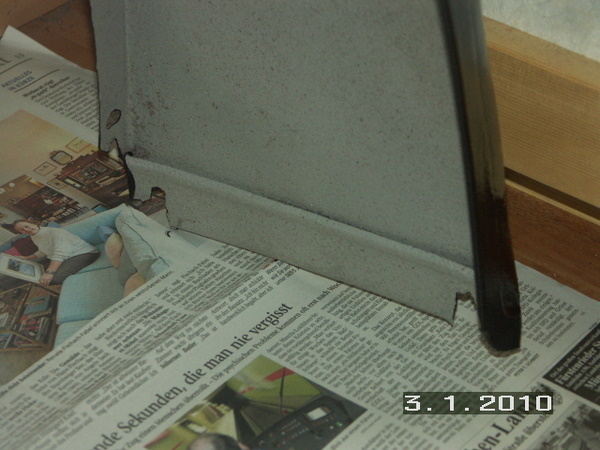 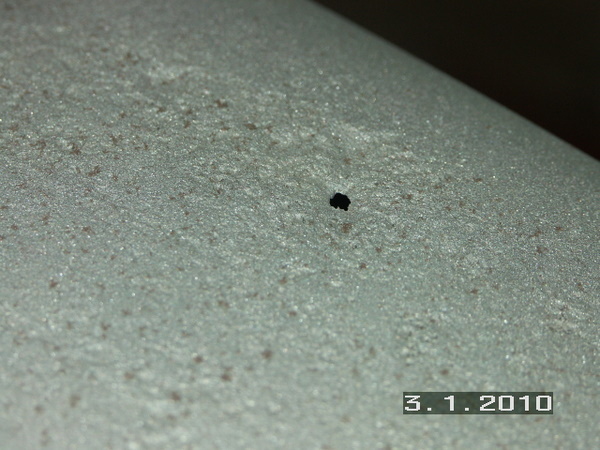 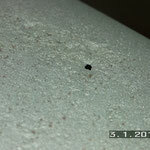 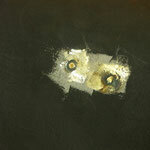 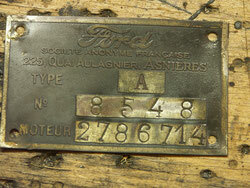 The wood gas generater itself had been removed long before. 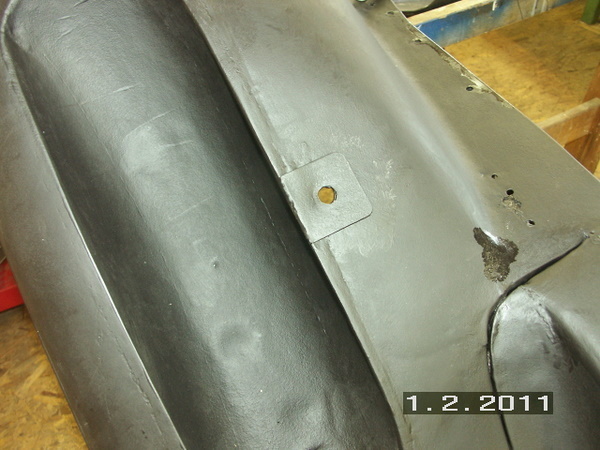 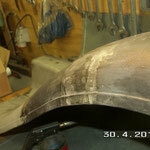 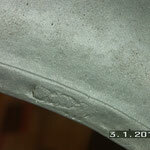 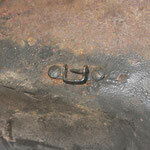 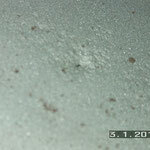 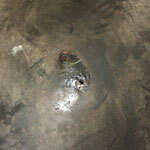 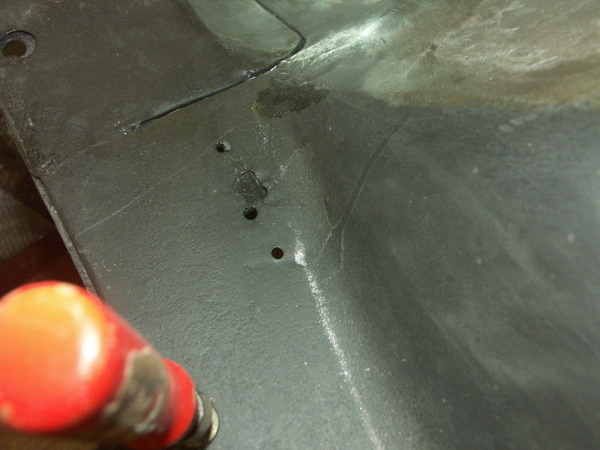 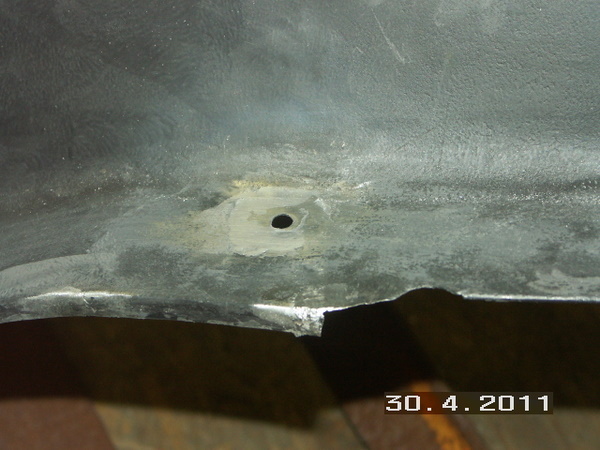 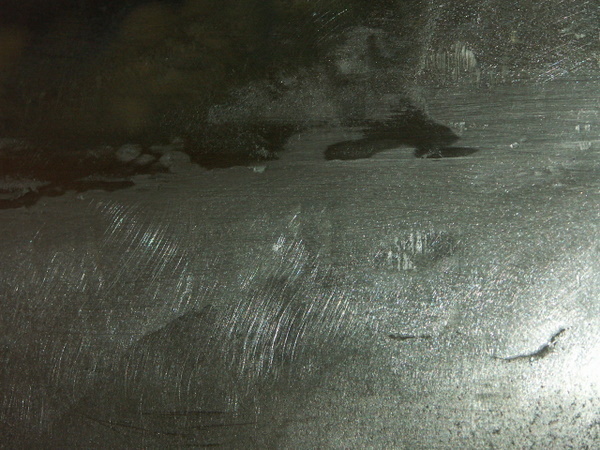 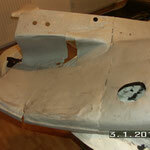 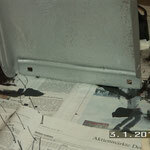 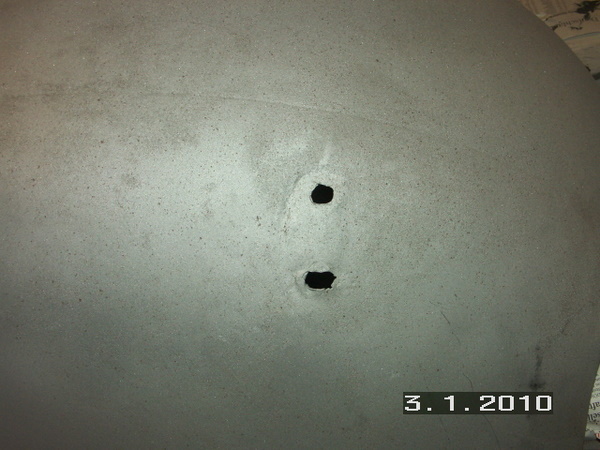 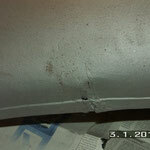 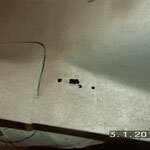 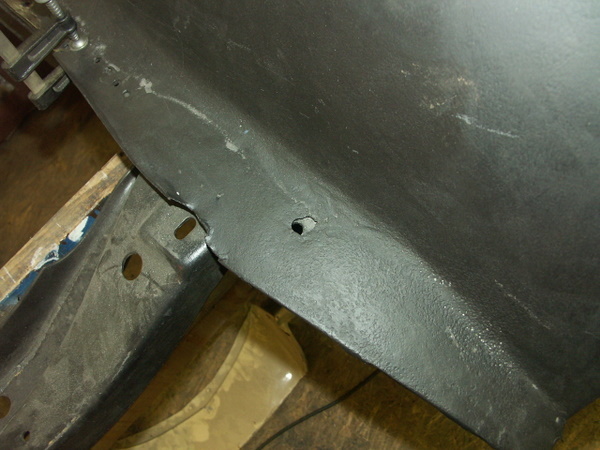 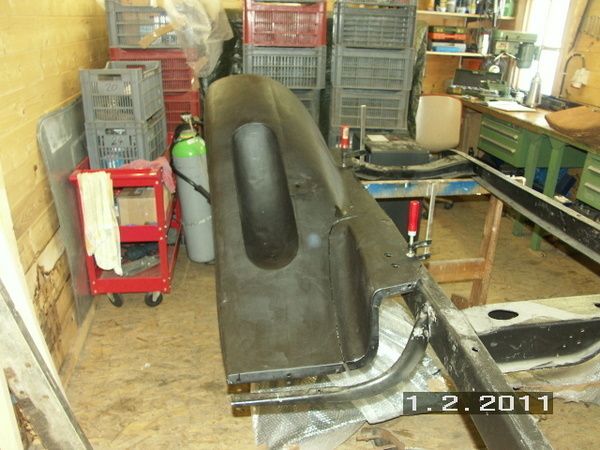 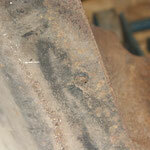 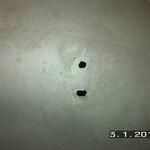 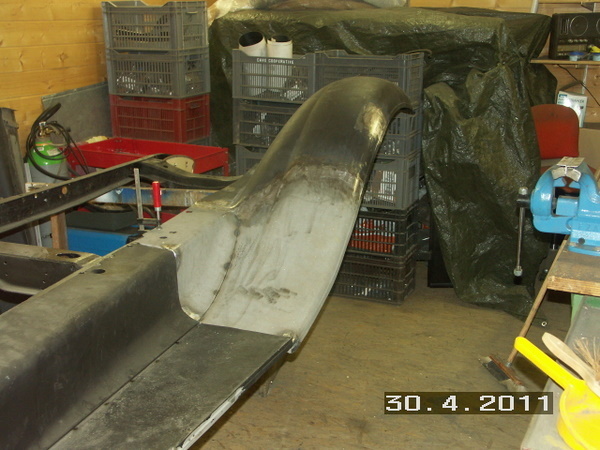 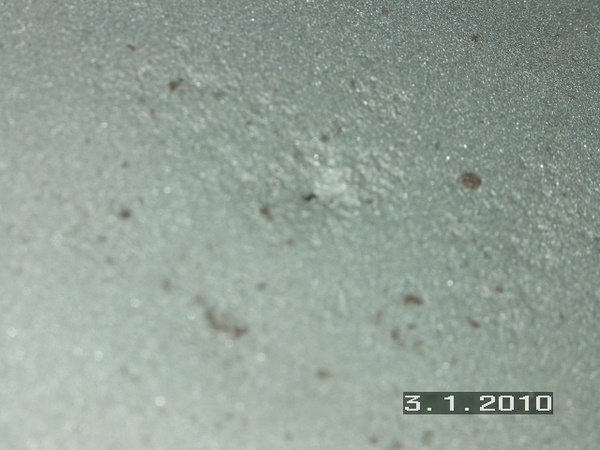 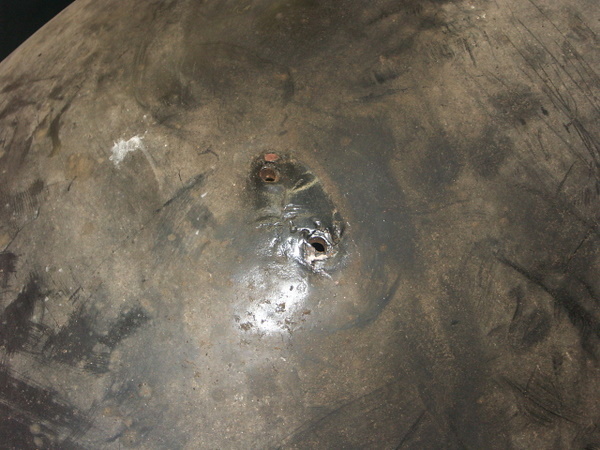 In the left fender there was spare wheel well, which was not original and has been closed. 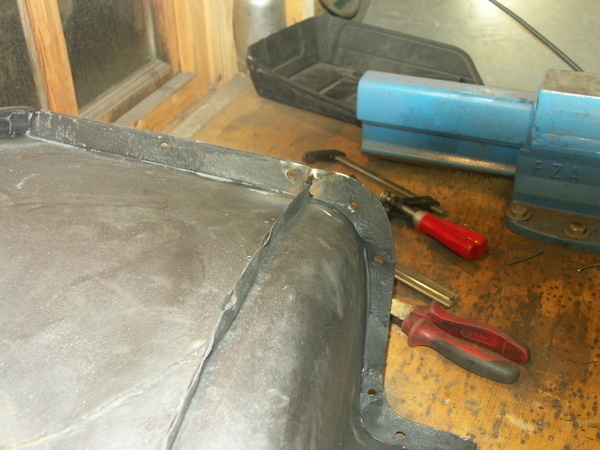 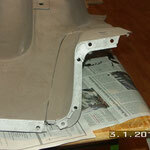 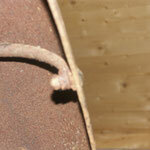 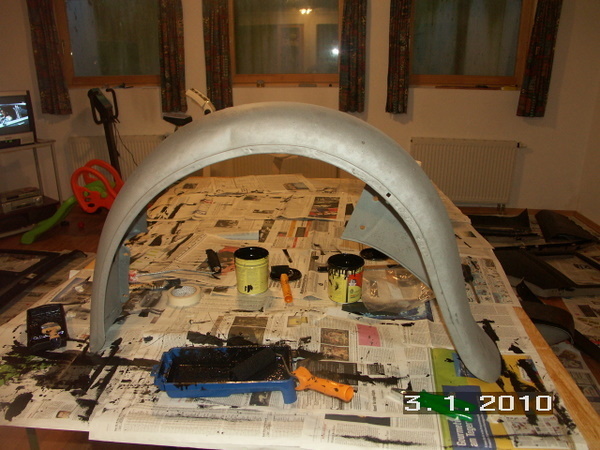 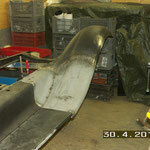 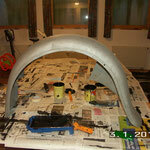 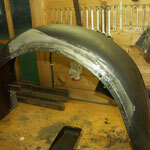 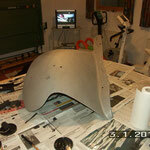 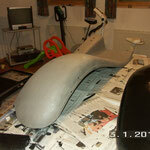 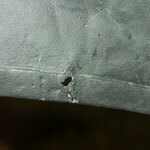 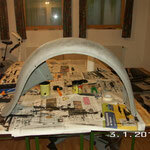 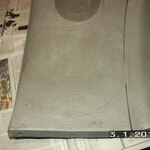 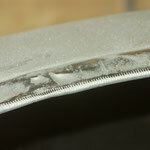 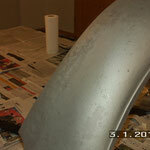 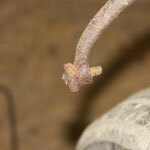 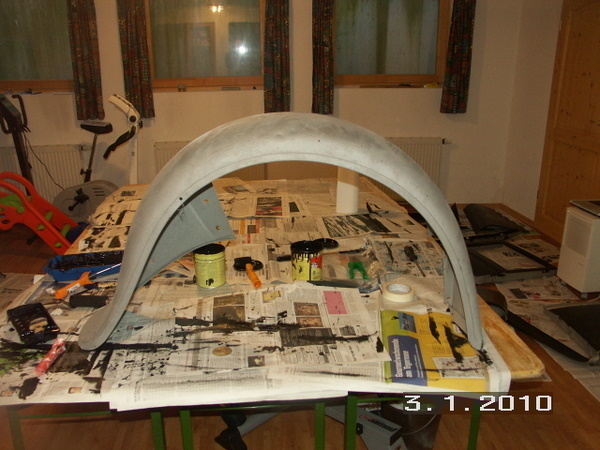 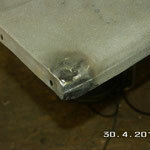 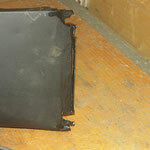 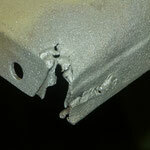 In the end we made to good fenders out of five bad ones. 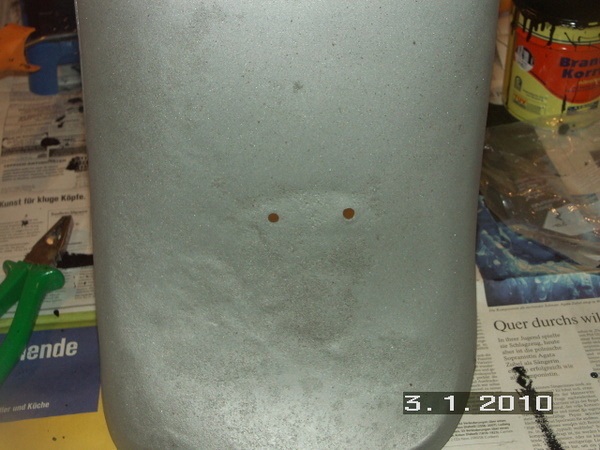 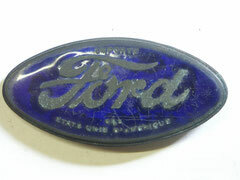 Three of these we bought at ebay.